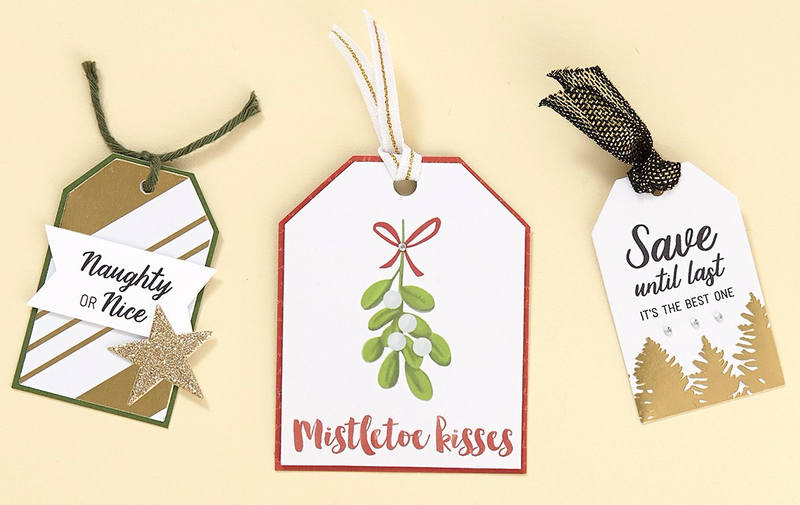 We can think of no better way to dress up a gift than with a personalized handmade tag, so we came up with a quick list of ideas to help up your tag-making game this season! 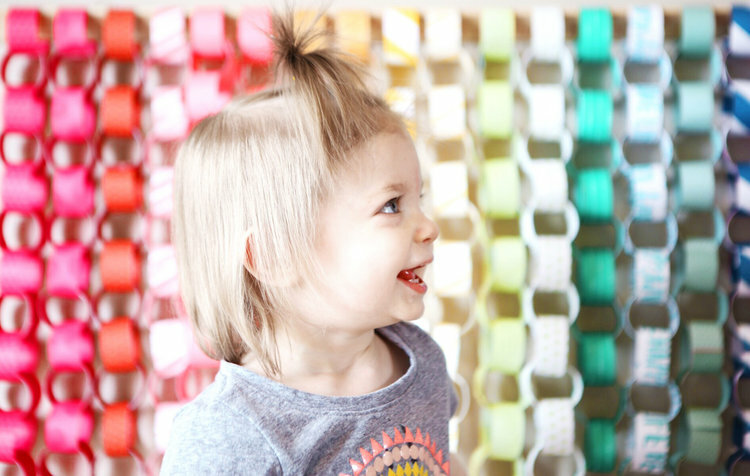 Select a few of your favorite shapes and let your Cricut® machine do the rest! 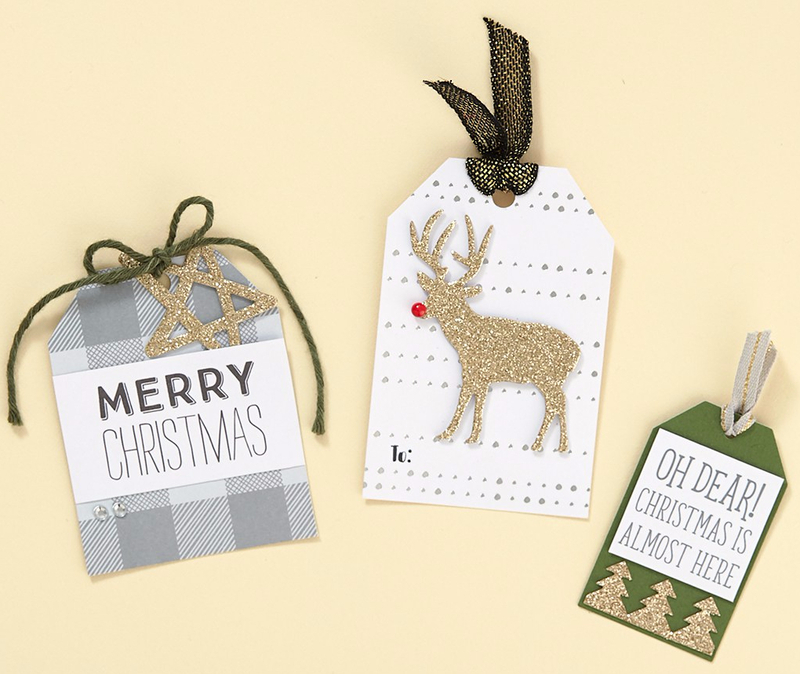 If you need to make a large number of gift tags, using a Cricut® shape is an easy way to get it done. 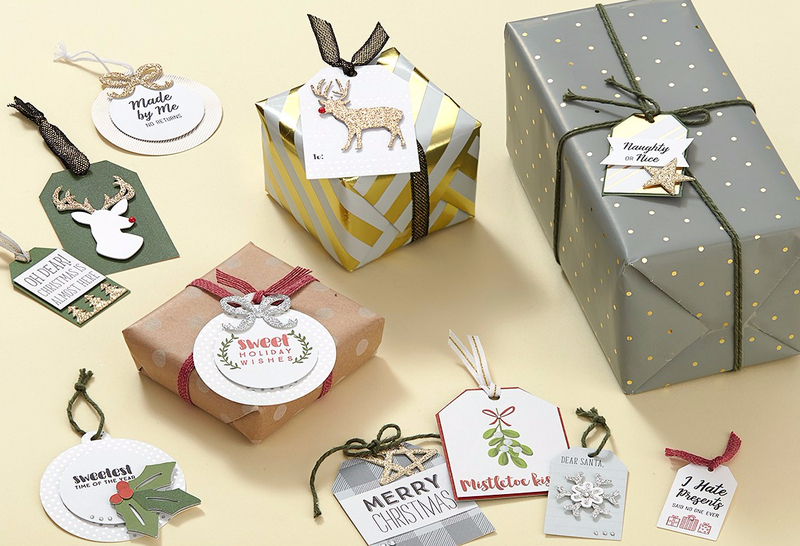 If you have extra pocket cards, try trimming them into a gift tag. 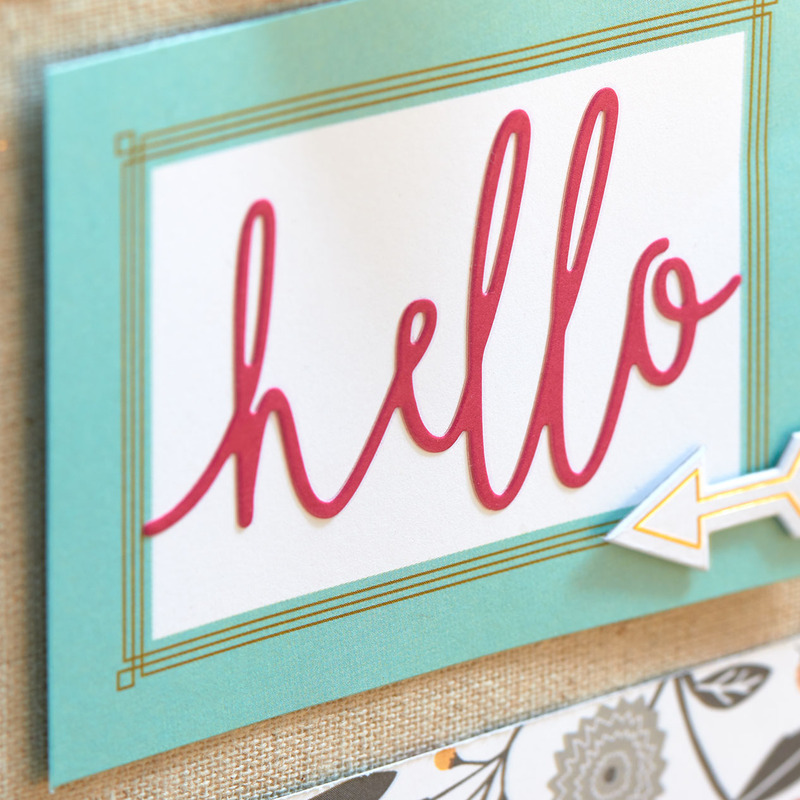 Your pocket cards can become the base paper or even the sentiment! This kit was designed for tag making! 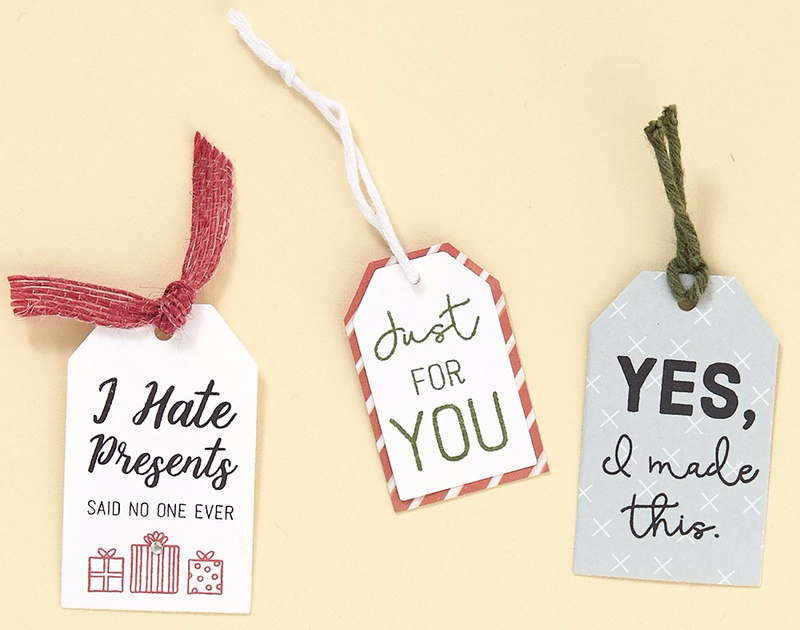 Pair these tags with different ribbons, embellishments, and sentiments to change their original look, and voila! You have beautifully unique tags for the beautifully unique people receiving them. 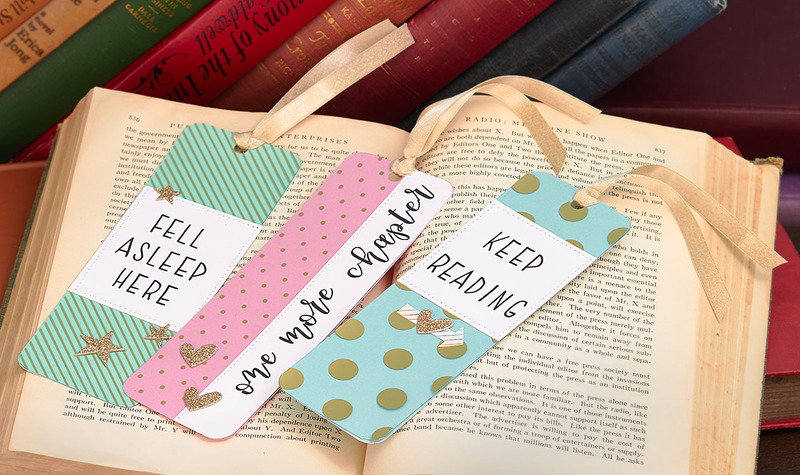 Make use of any extra complements you have by sticking them on gift tags! We all have scraps of paper lying around from bigger projects we’ve worked on in preparation for the holidays. Instead of throwing it away (or hoarding it! 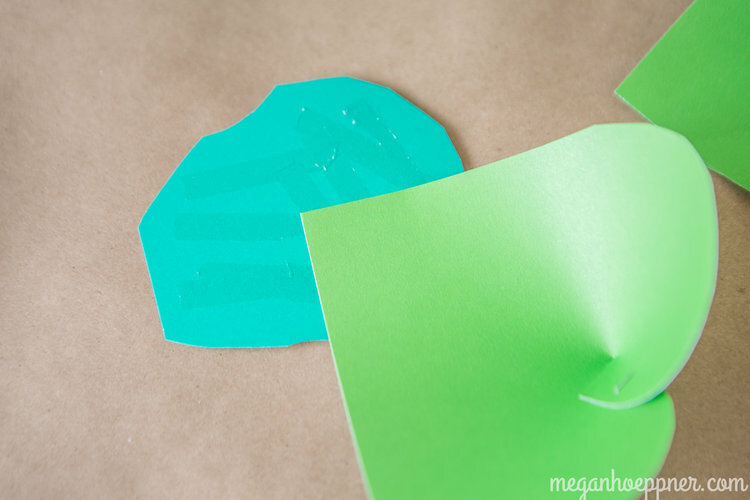 J) turn your scraps into little gift tags with some fun stamps and ribbons! Who knew that so much cuteness could fit into such small pieces of paper! 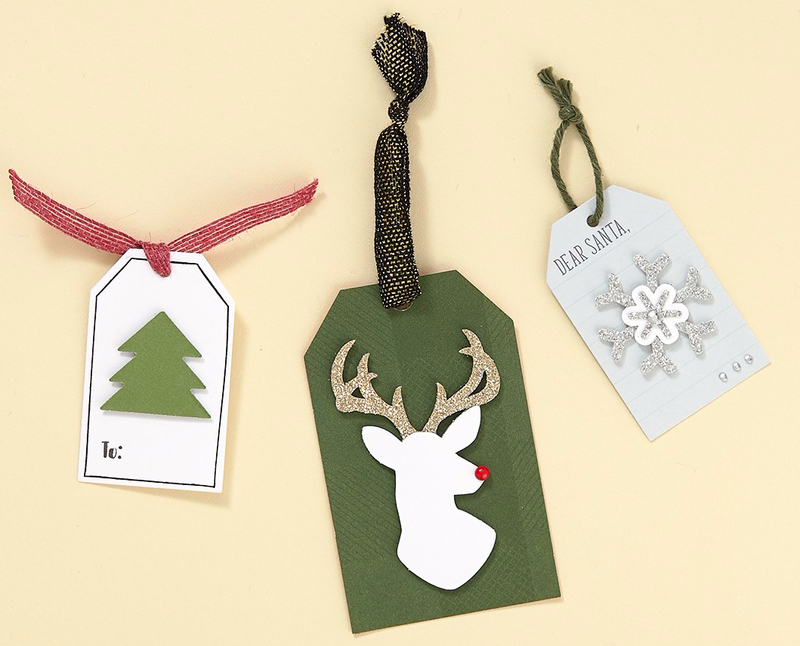 Make your gift giving that much more special this season with some personalized handmade tags! Share your results with us in the comments below! 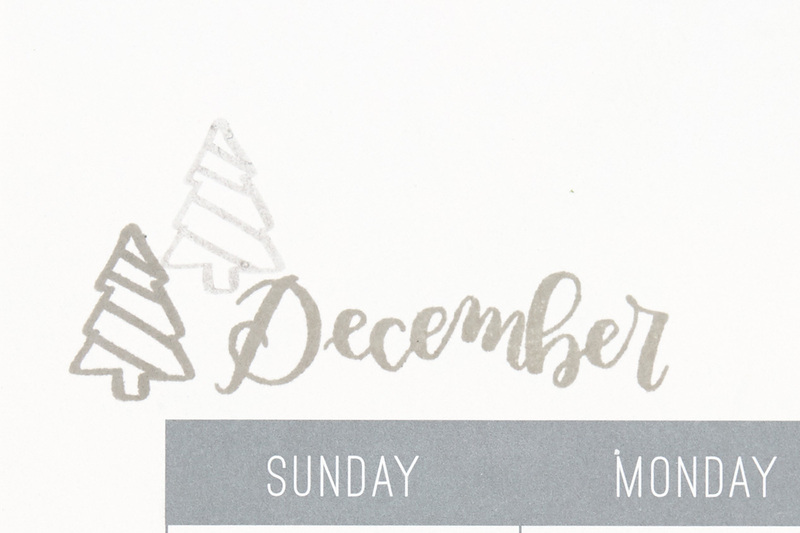 As 2017 comes to a close, we have a holiday treat designed to last you through the coming year and more! 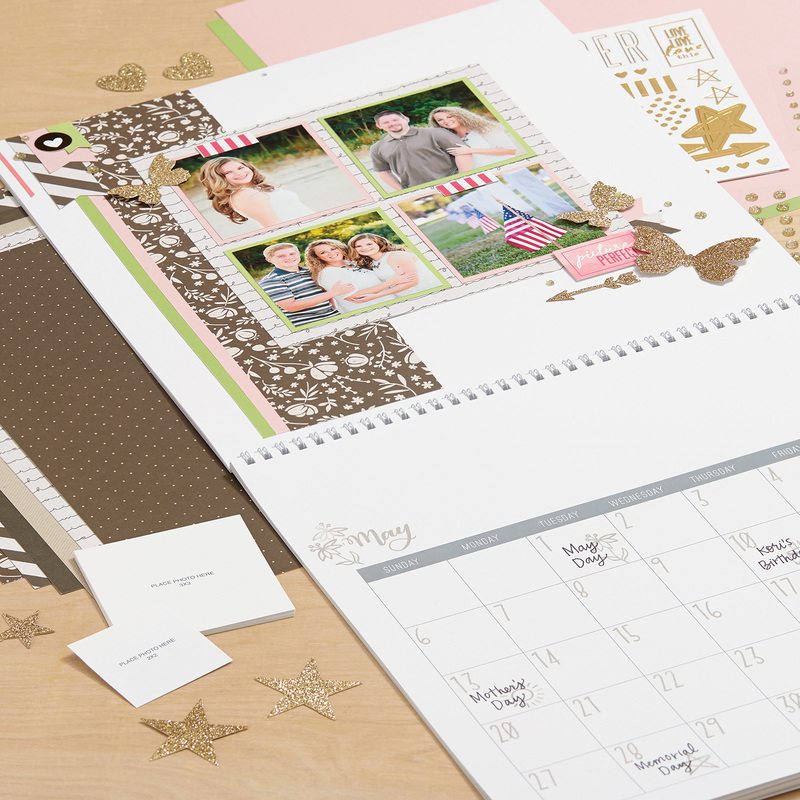 This Through the Year customizable photo calendar comes wrapped together in a kit containing everything you need to make one of your very own! 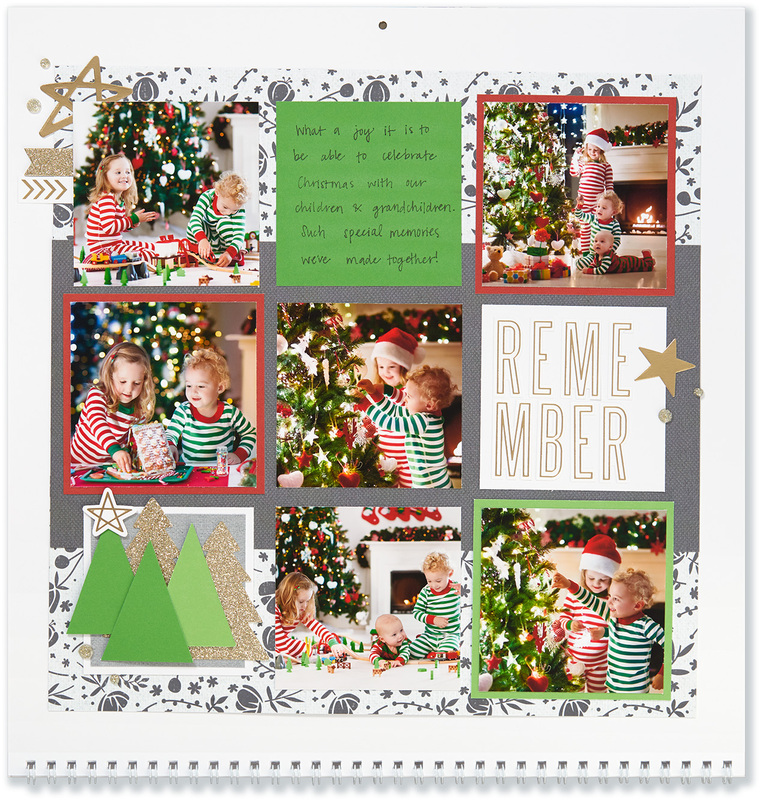 Easy-to-follow instructions included in the kit will guide you in creating each of the 12 beautiful calendar pages you see below. 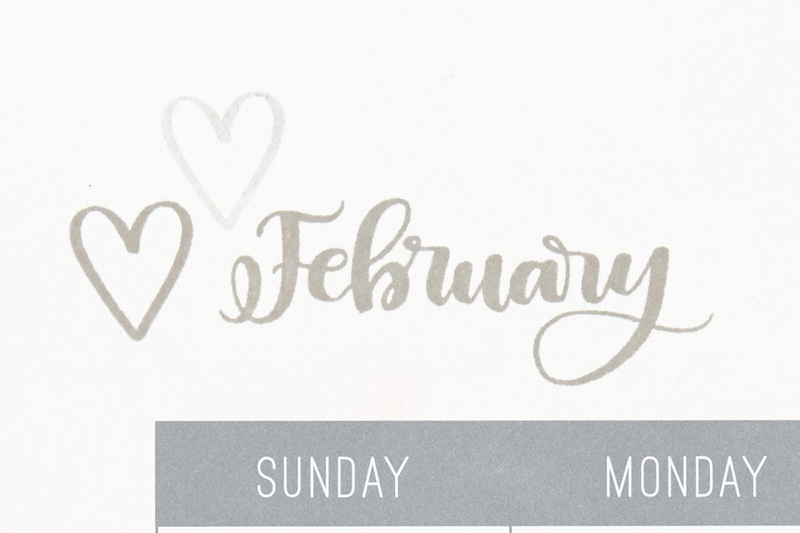 Calendars make great gifts, so in addition to making one for yourself, consider making a second one to give as a gift, or even giving the kit to someone you know who will love the chance to be crafty! Whatever you choose to do with this kit, you will not be disappointed with the result! 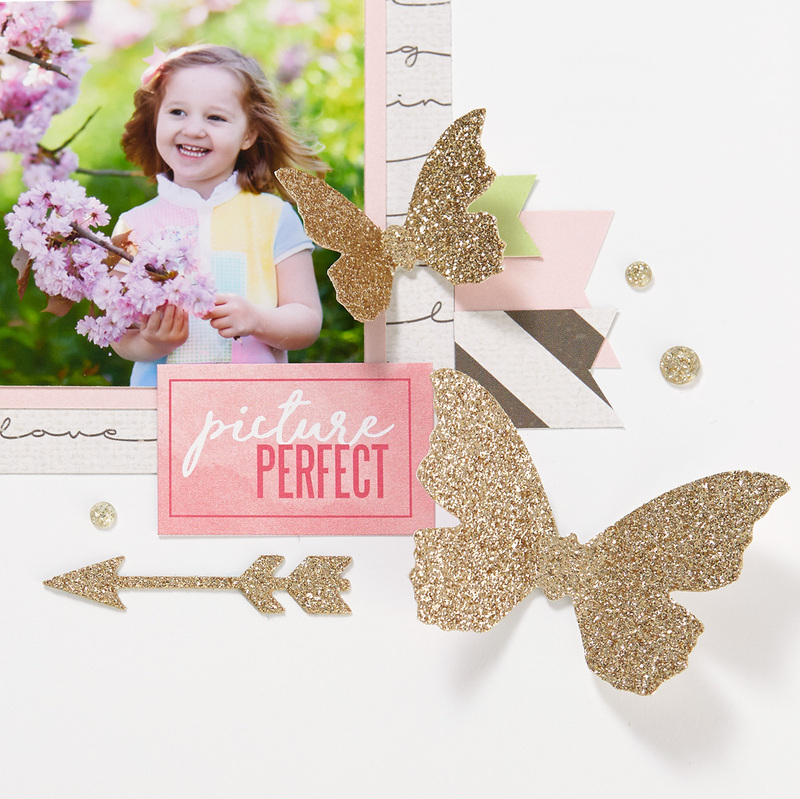 Take a closer look at some of the beautiful details you’ll add to your pages using the custom gold glitter die-cuts, glitter gems, Complements, and papers included in this unique kit. 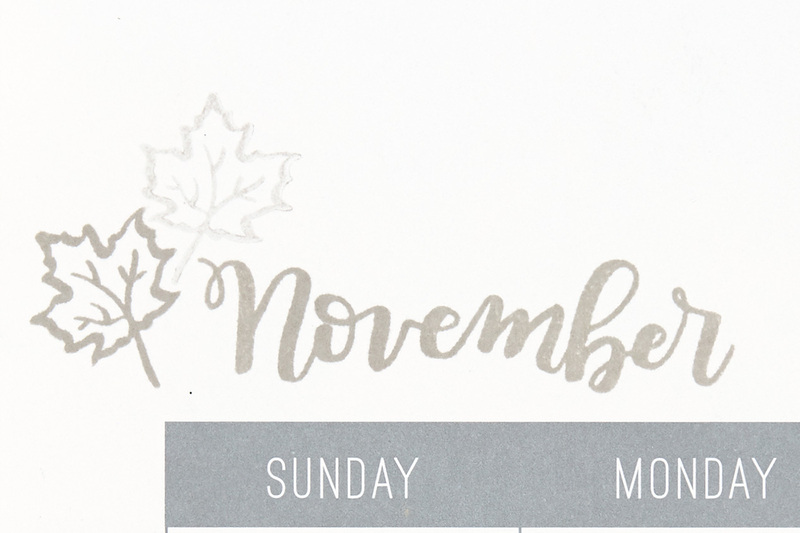 Our November Stamp of the Month, Through the Year, makes the perfect companion for this project, too. 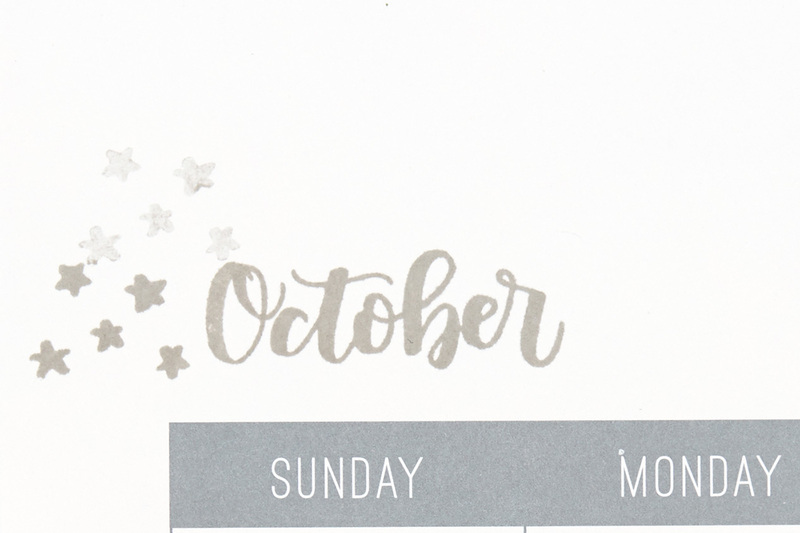 If you didn’t get this limited-time stamp set last month, you can still get it by choosing the calendar kit that includes it! 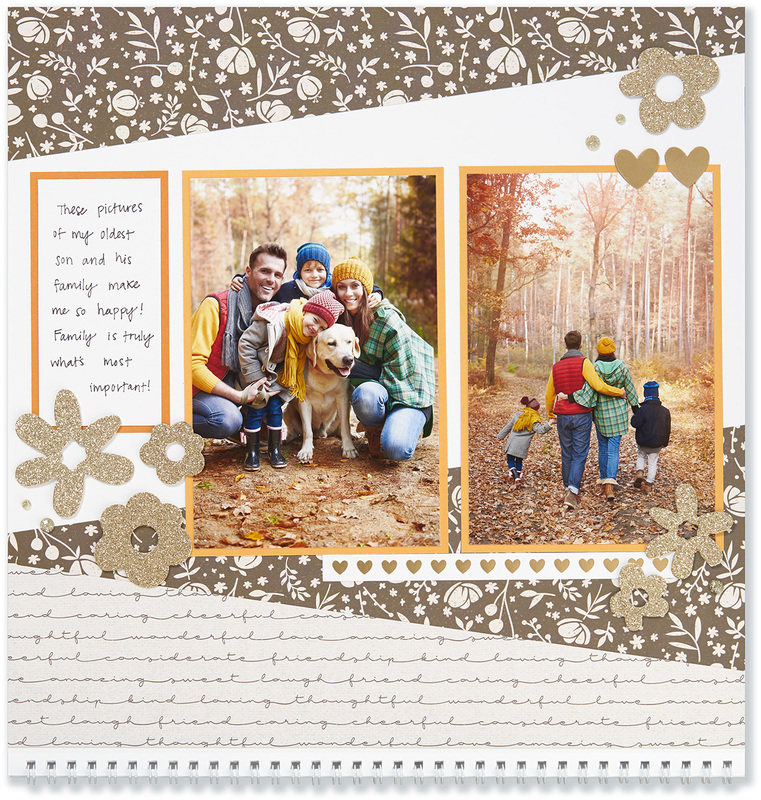 And, in case you did get the November Stamp of the Month, we also have this kit available without the stamp set. 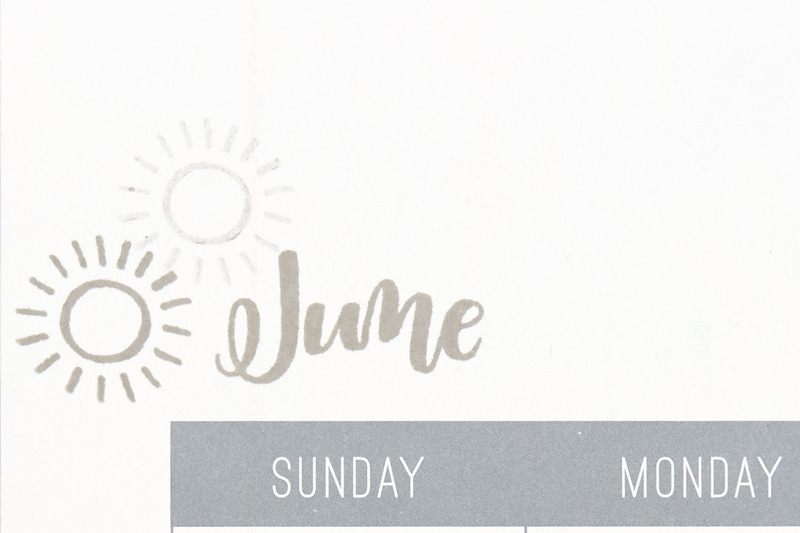 What makes the Through the Year calendar extra special is that the pages are designed to be cut at the spiral binding and then put into Memory Protectors™ inside an album. 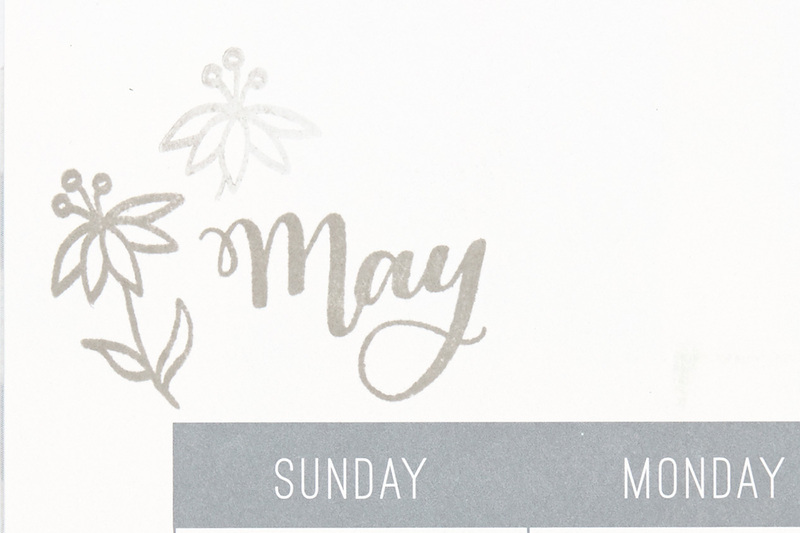 This way, when you’re through with the calendar, the beautiful pages you’ve relied on through the year will last through the years to come! 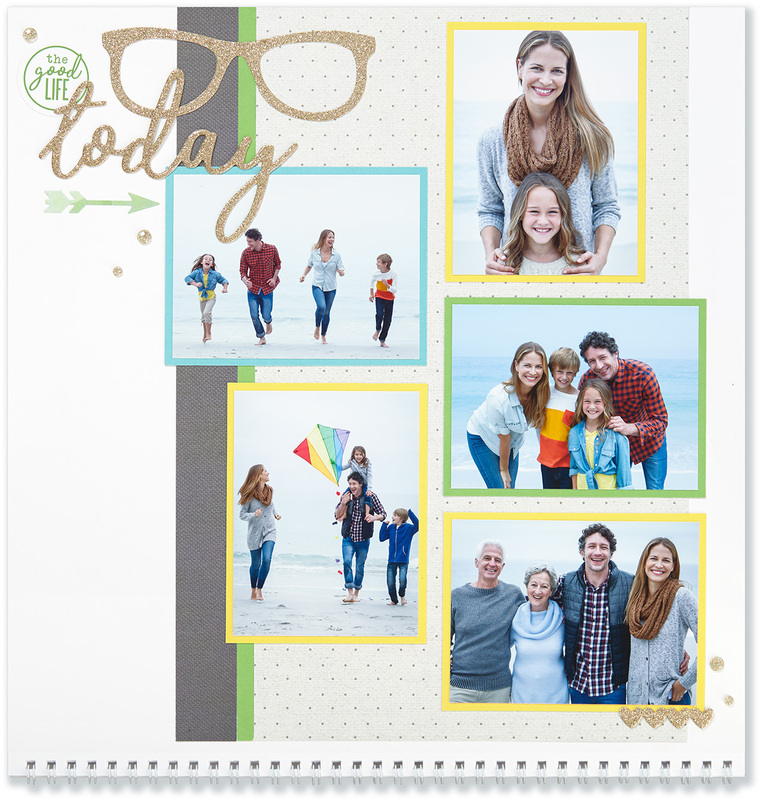 What a beautiful way to put some of your most favorite memories on display and later preserve them! 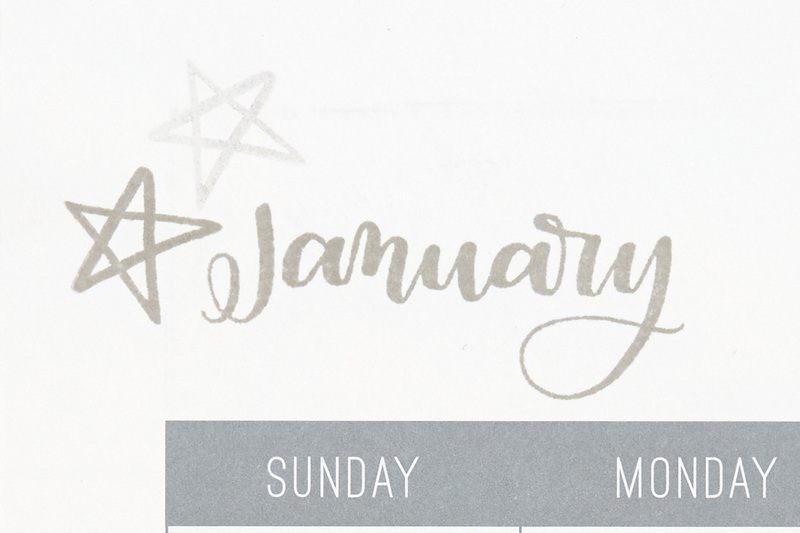 Make one of these Through the Year calendars for yourself or as a gift this Christmas! 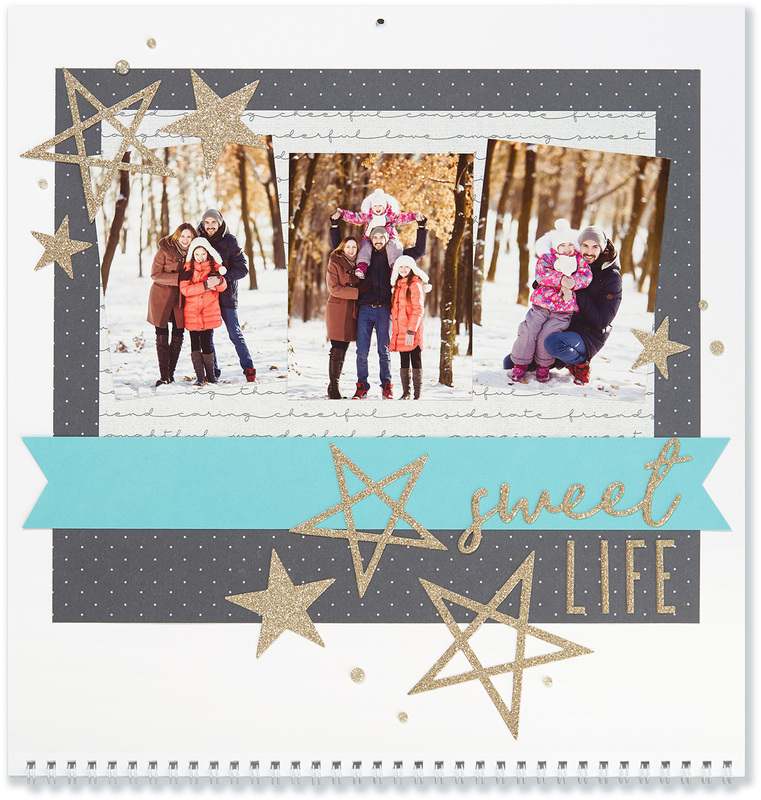 By this time of year most of us have already taken new family photos (or have them planned for the very near future) in anticipation of turning them into beautiful Christmas cards to share (and show off ☺). 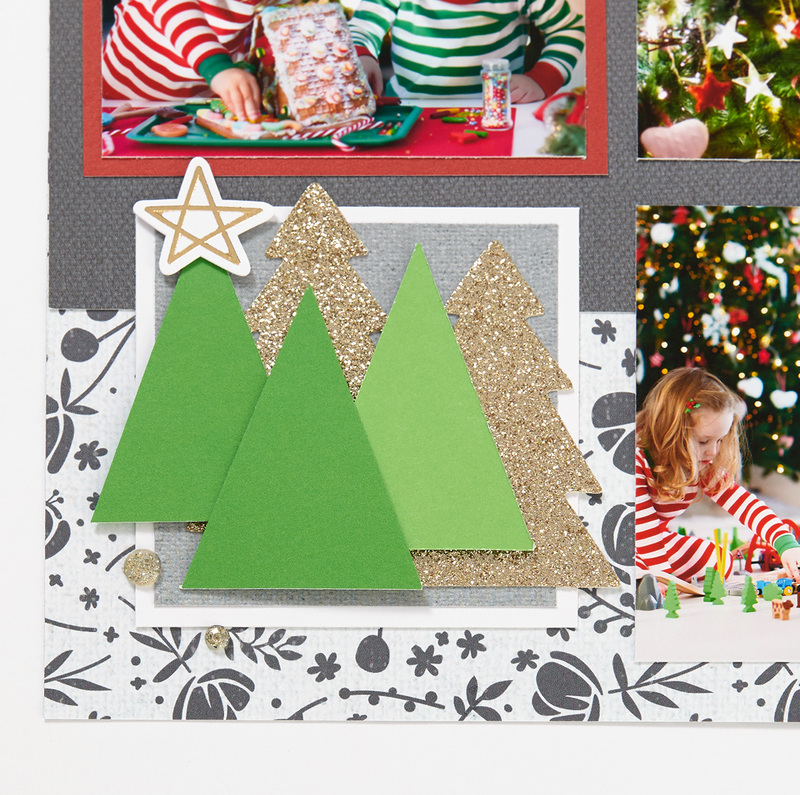 This year, instead of having someone else print and make your holiday cards, make them yourself! 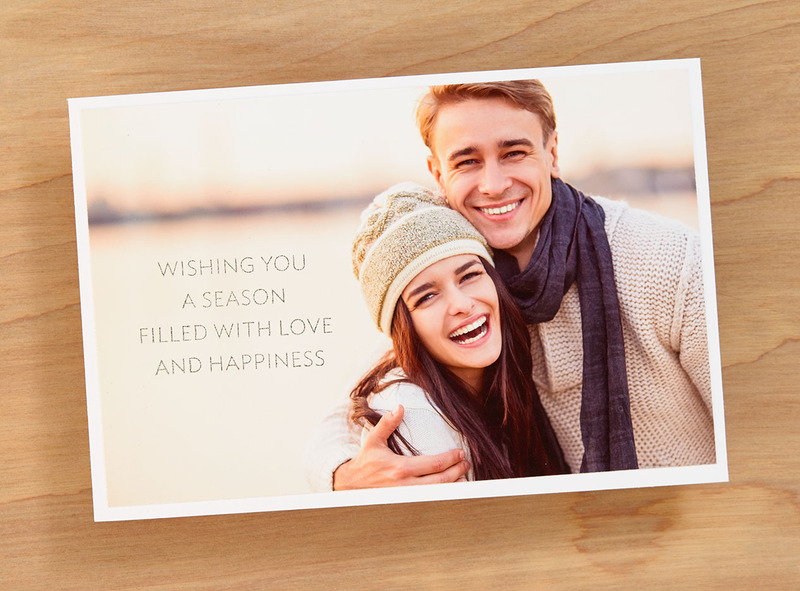 We’ve prepared some tips to show you how to personalize your cards even more using your creativity rather than someone else’s ready-made template. Check out the tips below as you’re thinking of all the people you plan to send a little holiday cheer to. 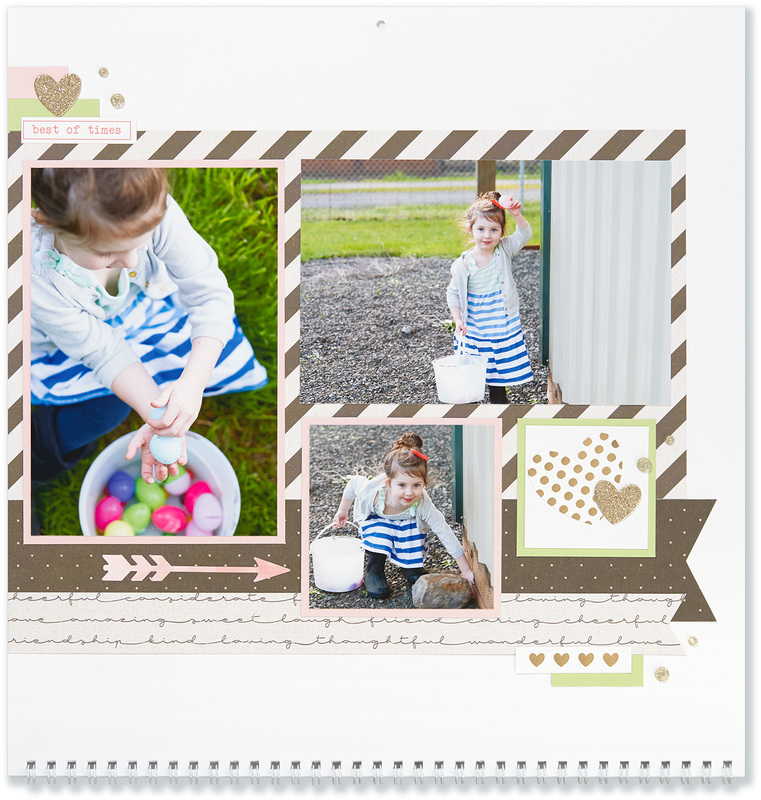 Tip #1: When stamping on your photo, use one with lots of negative space. 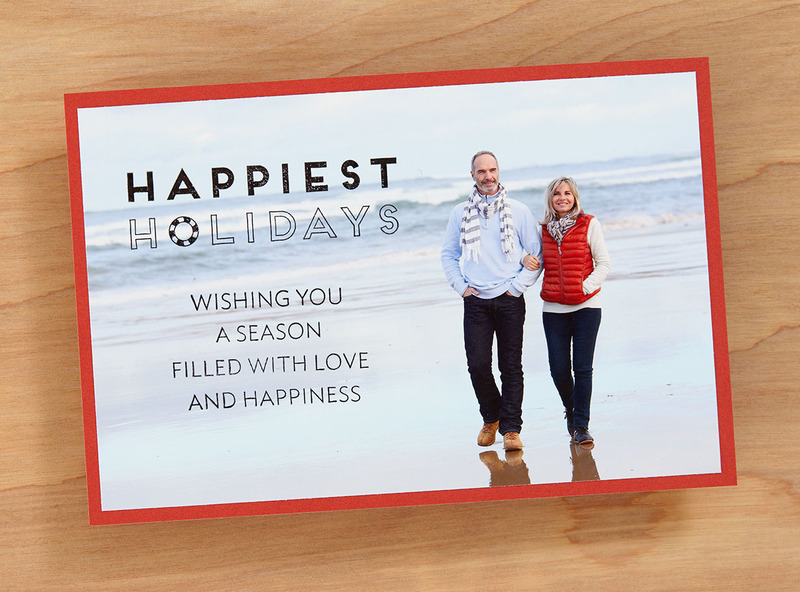 To stamp a holiday message directly on your photo, choose one that has lots of negative space, like the photo above. Negative space is all of the area surrounding the subject of your photo. 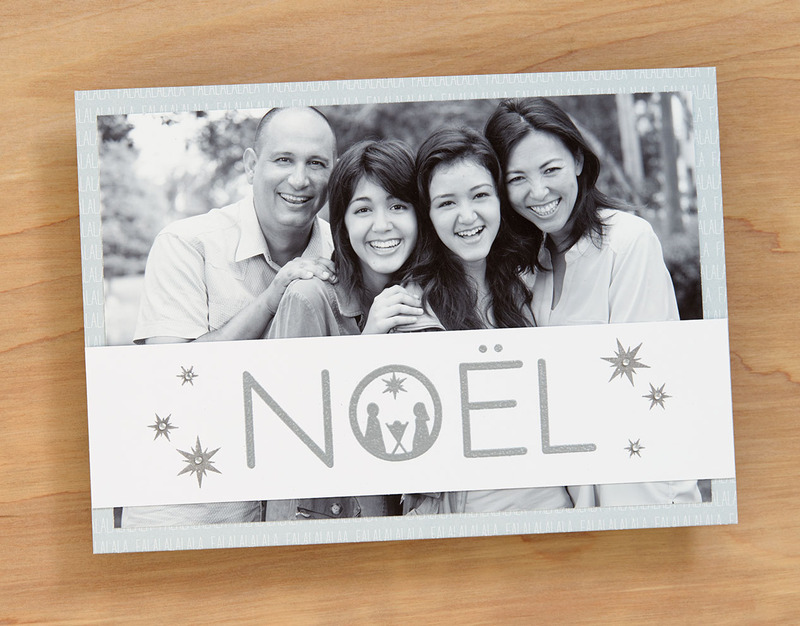 Using a photo with plenty of negative space gives you a place to stamp your holiday message without covering the subject—like the face of one of your family members! 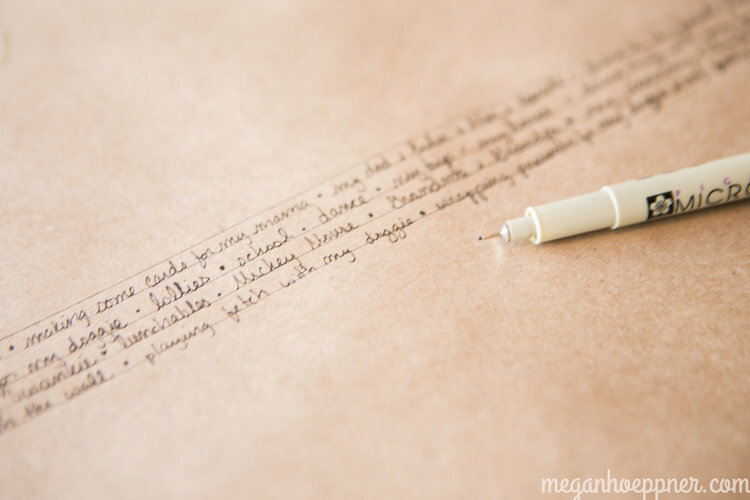 Tip #2: Matte photo paper works the best with any ink. Keep in mind that VersaMark™ ink will absorb quickly into the matte photo paper. 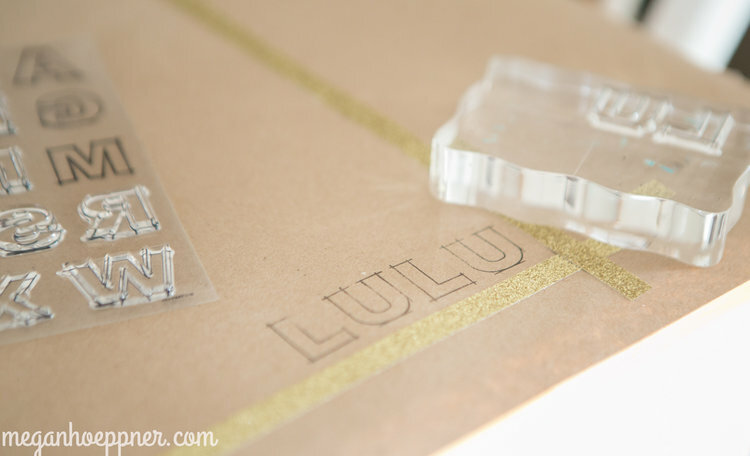 If you are going to stamp and heat emboss multiple images, emboss between stamping each image to make sure the embossing powder sticks to the ink. 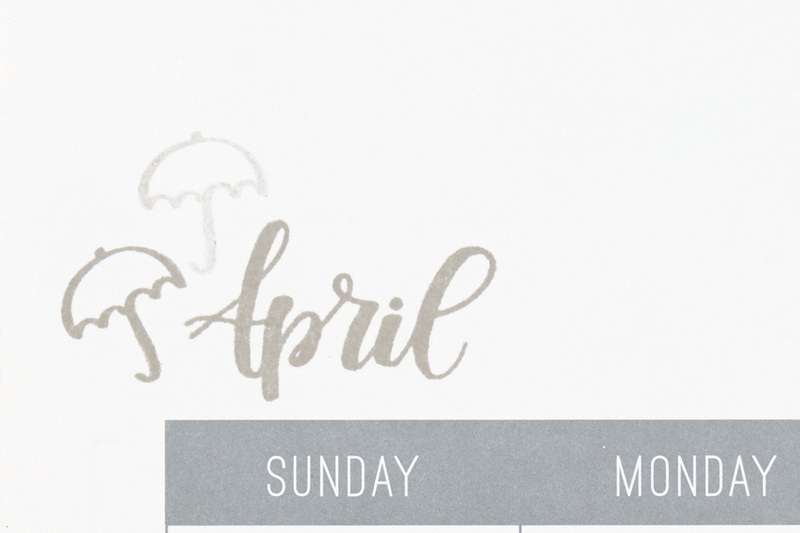 Tip #3: Glossy photo paper requires StazOn™ Ink. 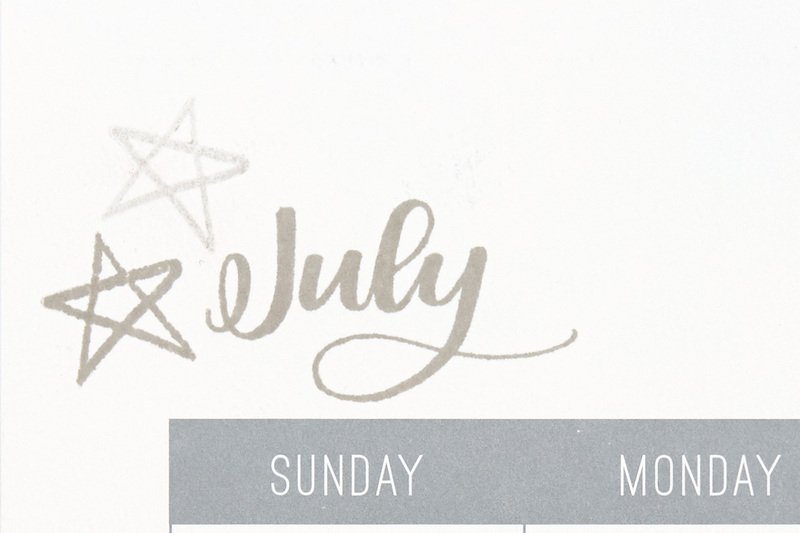 If you prefer the finish of glossy photo paper, you can still stamp on it! Just use the StazOn™ Ink Pad. This ink is especially meant to work on smooth, nonporous surfaces, and it will adhere to your photo much better. Other inks will smear on glossy photo paper. 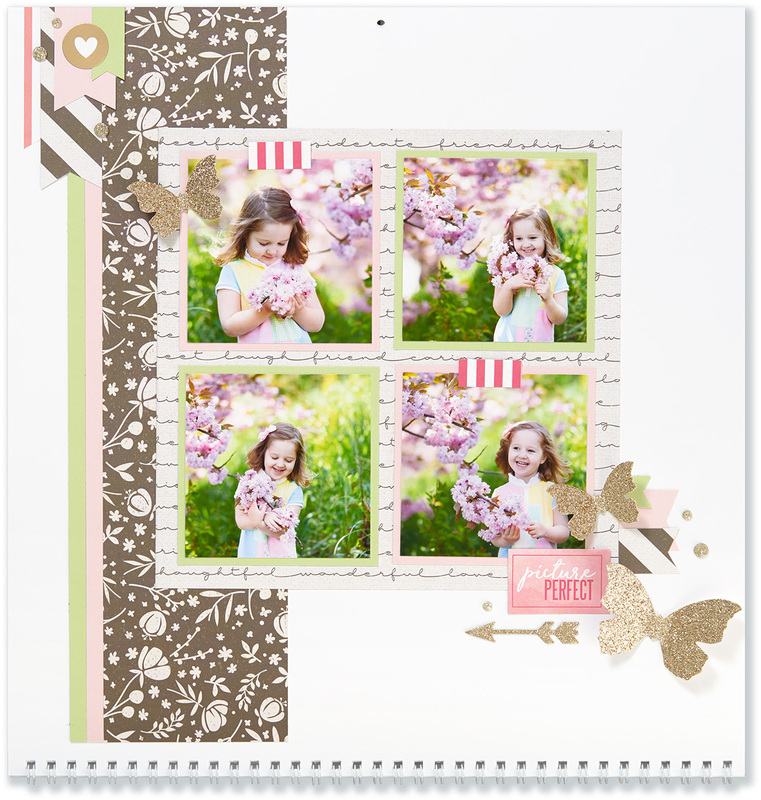 Tip #4: Use a strip of cardstock over your photo for the stamped image. 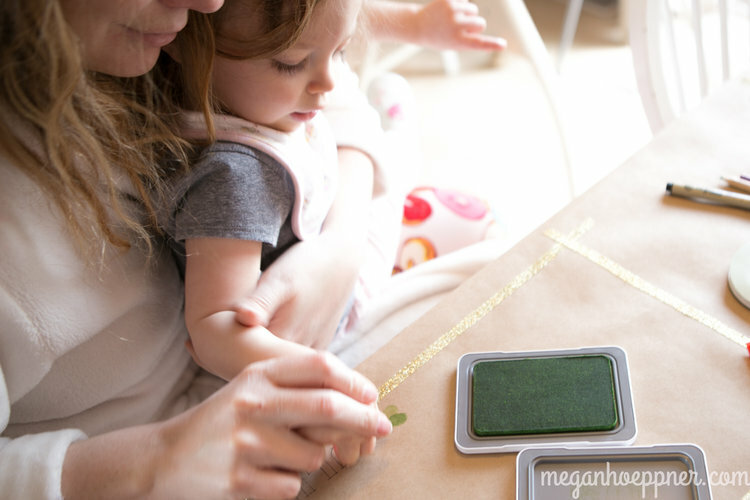 What if you aren’t sure about stamping on a photo? 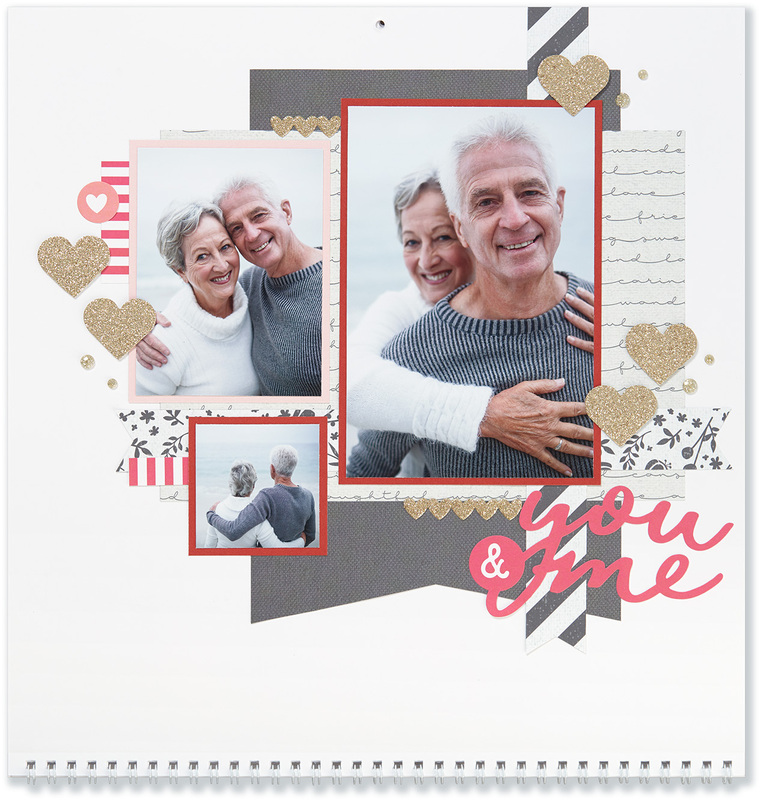 Or maybe your photo doesn’t have space for a sentiment? That’s ok. You can stamp or emboss your message on a piece of cardstock to adhere on top of your photo like you see in the image below. 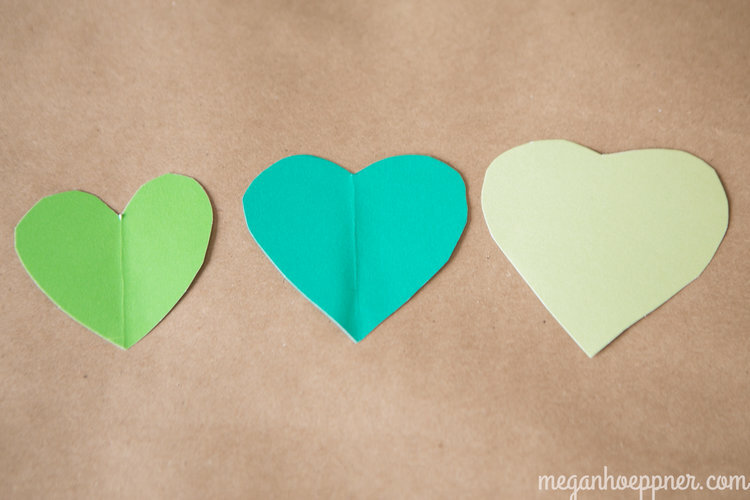 Tip #5: Make your photo card a different shape. 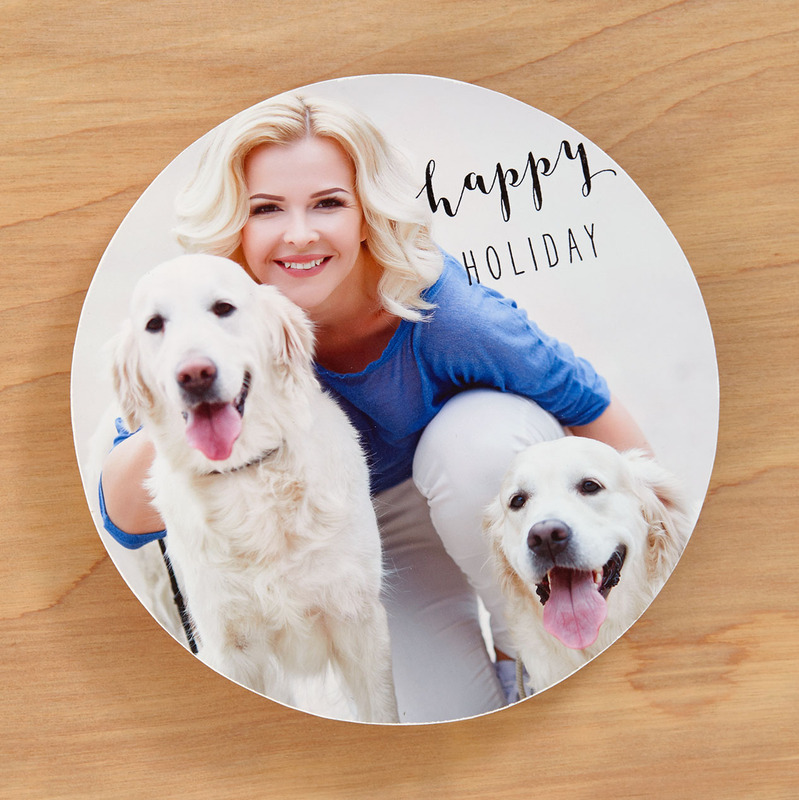 To create the circle card above, print a 5″ x 7″ photo. Then, trace a 5″ circle over your photo and cut it out. 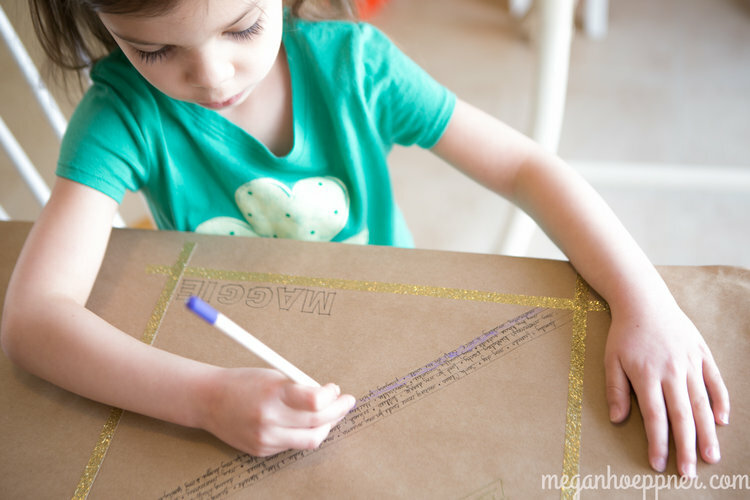 Finish by distressing the edges of your photo to hide any pen or pencil lines. Tip #6: Don’t forget your envelopes. When creating your photo cards, be sure to size your cards to fit in standard size envelopes. Here are some examples that we used. 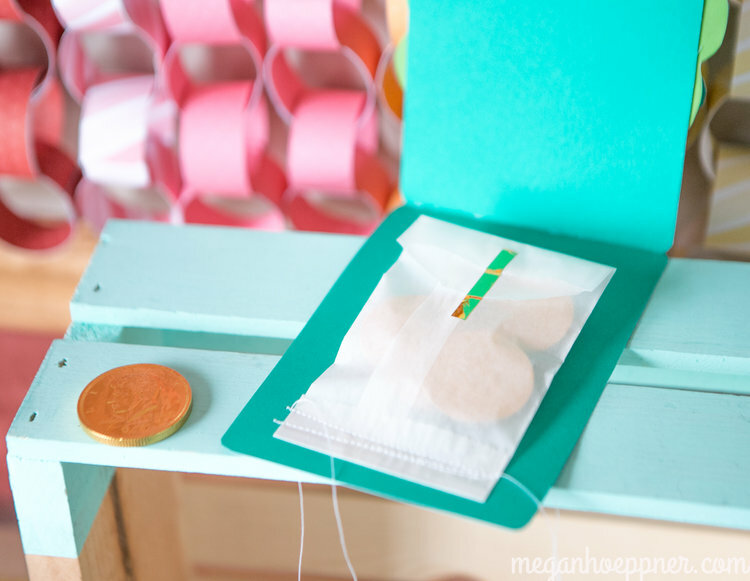 These are common envelope sizes that you can find at your local craft store or online. The photo card size refers to the dimensions of the entire card. 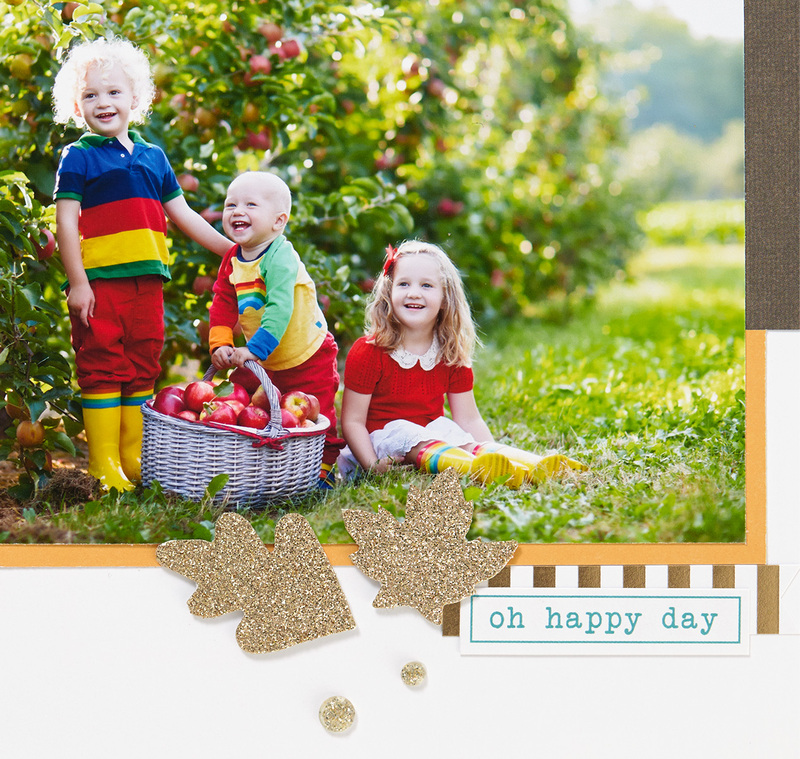 If you like the look of having a mat behind your photo, trim your photo and then attach it to the cardstock or paper mat of your choice. The photo card above measures 4″ x 6″, including the photo mat. The envelope type that will fit this size is A6. 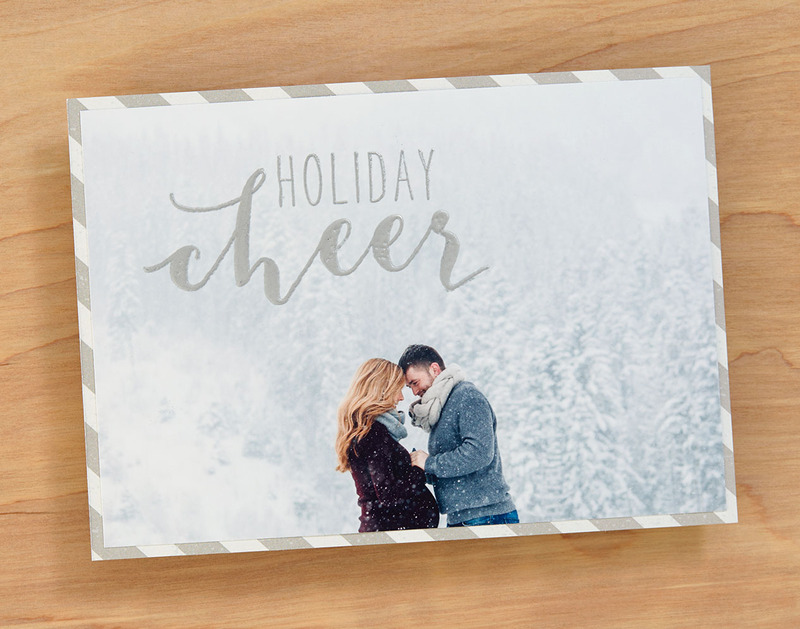 You’ll notice that this card also has great negative space for stamping the holiday message. One of the great things about making your own holiday cards is that no two cards have to be the same. You can personalize each sentiment and use different photos if you want to. Our friends at Persnickety Prints are standing by with some great deals going on right now! 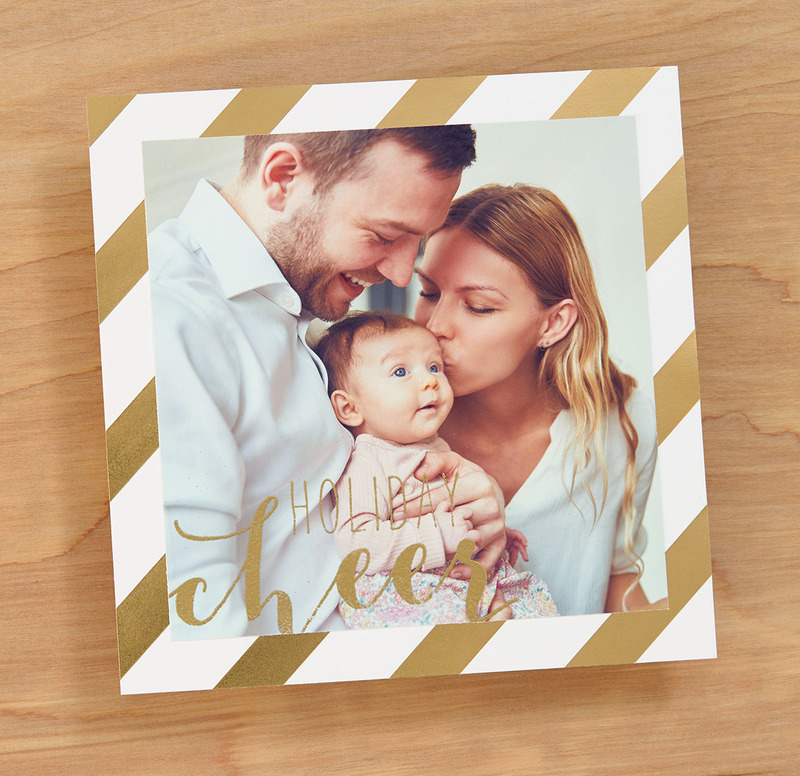 Check them out to get your photos printed and get started on creating your own personalized Christmas cards this year! 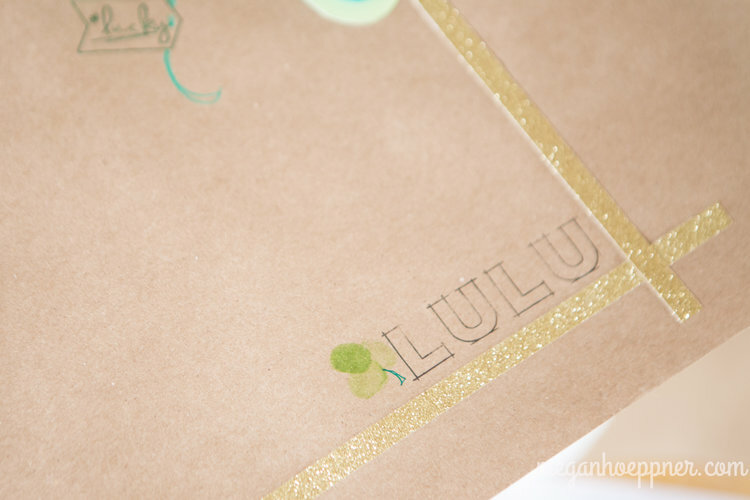 Earlier this year we showed you how to use the Cricut® Flower Market Collection for a springtime monogram. Today we have some artwork that just goes to show that this truly is a collection for all seasons! Take a look at this beautiful wreath celebrating the upcoming fall! 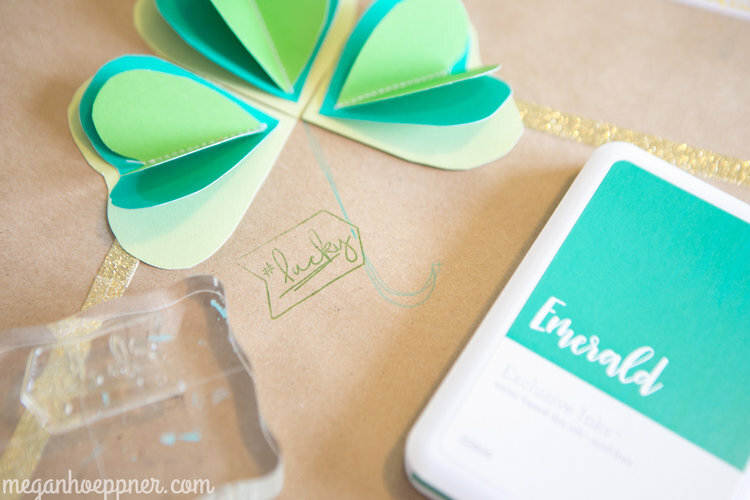 When working with Cricut® shapes in your décor, add dimension and life by curling and bending petals and leaves. Add embellishments, like buttons and ribbons, for more textures, details, and volume. With its changing leaves in rich hues of reds, oranges, and yellows, fall is by far the most colorful season of the year to draw inspiration from. Bring some of those glowing vibrant tones into your home by creating some of your own décor pieces—it’s all about where your creativity takes you! We have condensed the original blog post for brevity. To read the original, visit Megan’s blog. 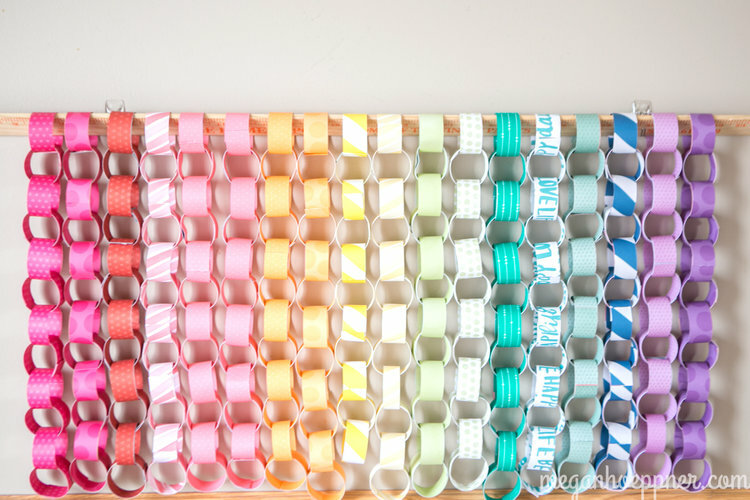 This year I received a box of goodies from Close To My Heart, including a gorgeous assortment of paper offering a full spectrum of color, so I set to making paper chains. Once complete, I threaded them on a yardstick, which I hung above my table. 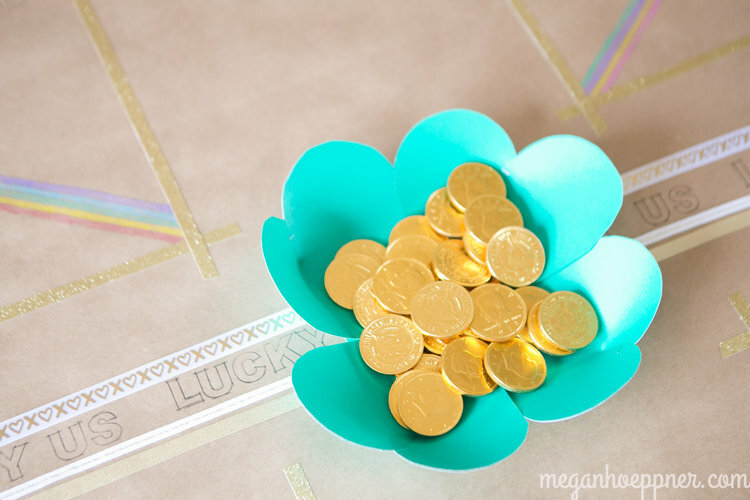 My paper rainbow makes a nice St. Patrick’s Day decor element and also a fun photo backdrop for this year’s pics. First, I covered my kitchen table in kraft packing paper. Then I set to decorating. 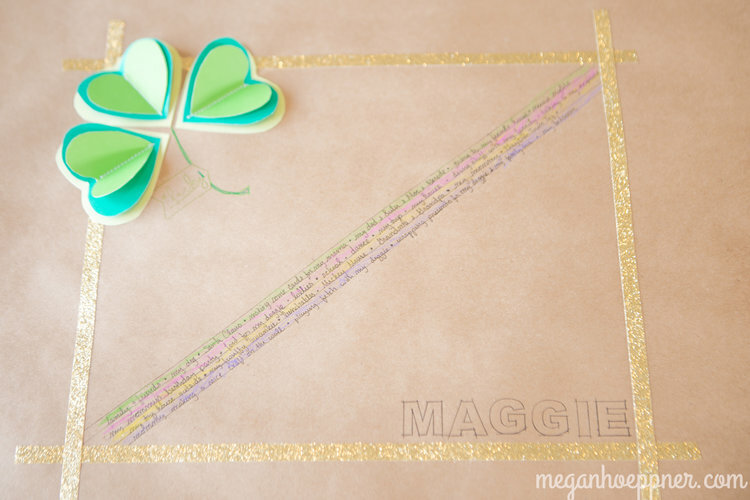 I framed each spot at the table using Close To My Heart’s gold shimmer trim and stamped our names using their My Acrylix® Framework Alphabet stamp set. 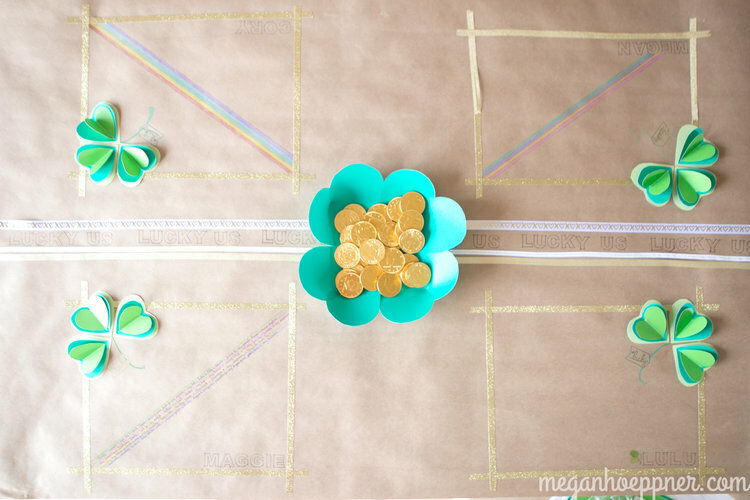 Wanting our decorated table to serve two purposes—fun and memory keeping—I drew rainbows across each taped “place mat” so we could write what we feel lucky to have. I loved helping Maggie make her list. What a doll she is! 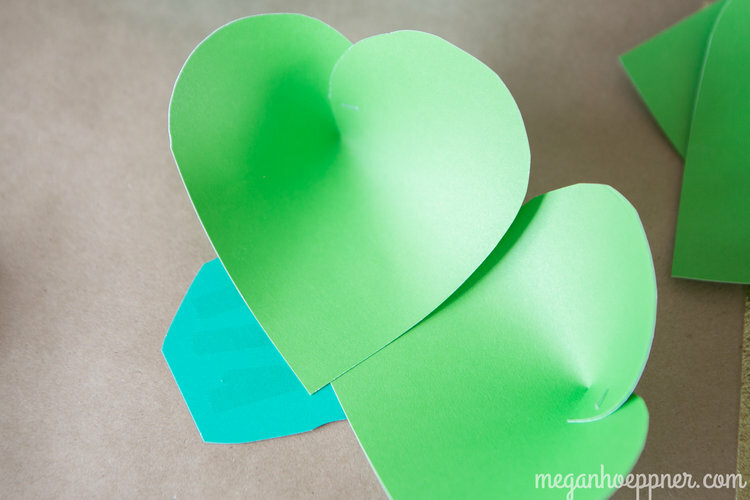 I used Close To My Heart cardstock in three shades of green (Willow, Emerald, and Sweet Leaf) to create a little pop on my table. 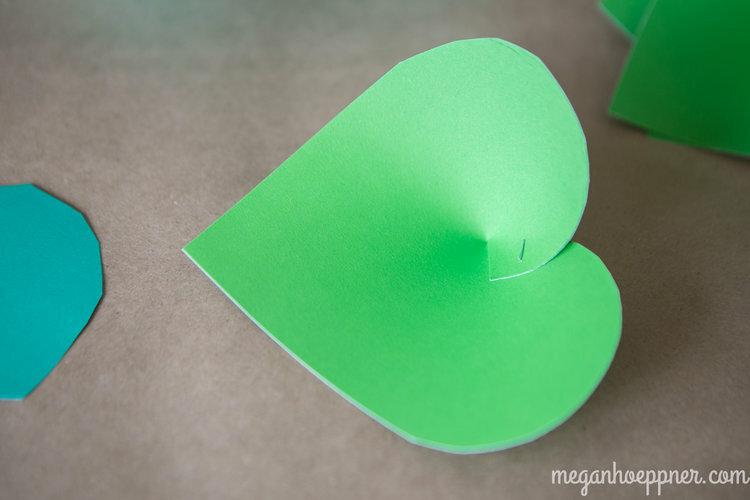 First, I cut cardstock hearts in small, medium, and large sizes, and folded the smaller two sizes in half to create a center crease. I then stitched along the crease to create the pieces of my clover. I pieced three heart stacks together to create a shamrock. 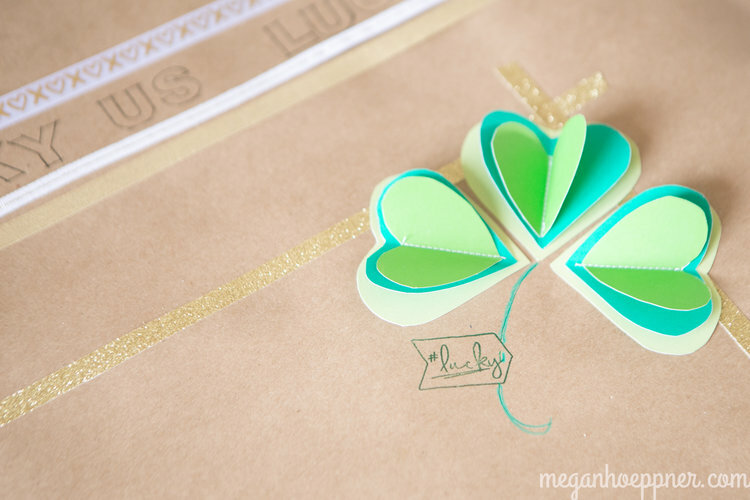 A little stamping along the hand-drawn stem, and I was ready to welcome the luck o’ the Irish. 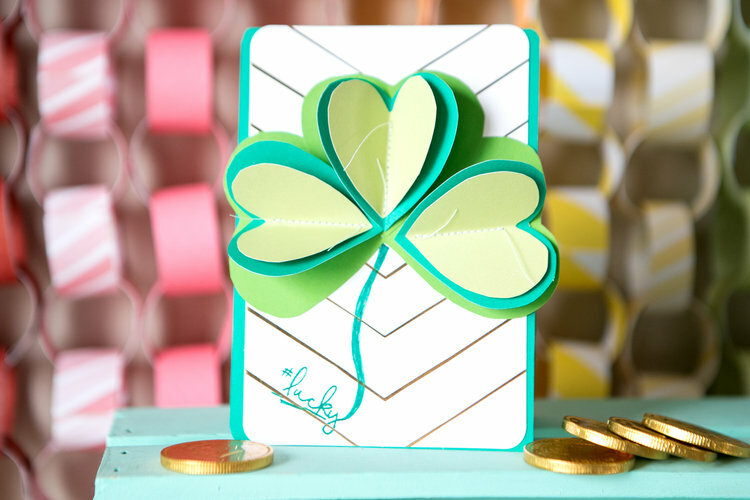 I used the My Acrylix® Some Kinda Wonderful—Scrapbooking stamp set from Close To My Heart to create the #lucky tag. 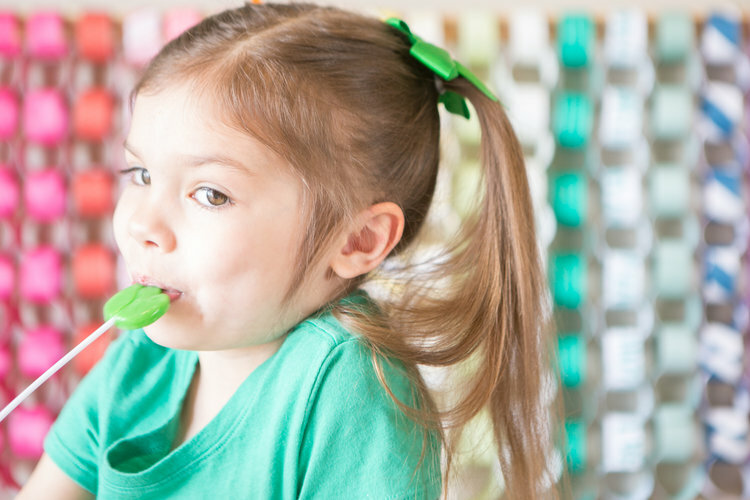 Time to add our St. Patrick’s Day treats to make the table time complete. 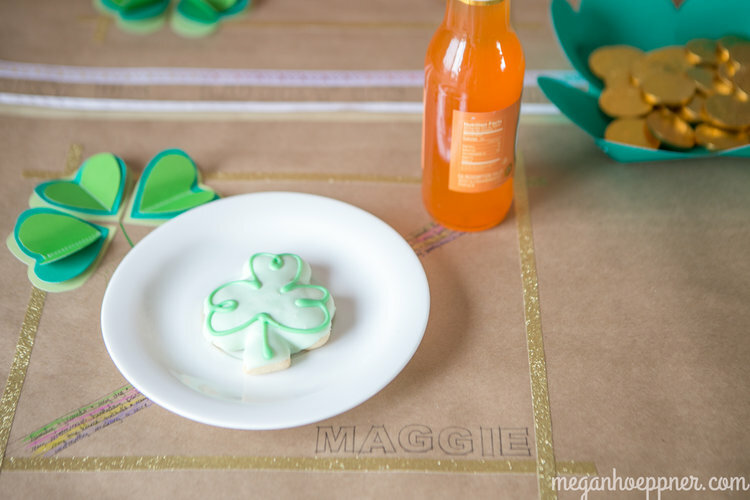 Oh, and I’ve found another way to use the 3-D clovers when our table is cleared. I’ll send a little luck on to others. I used the same Close To My Heart #lucky stamp, masking the outer frame around it. I stitched a vellum bag on the inside, creating a pocket for some chocolate coins. 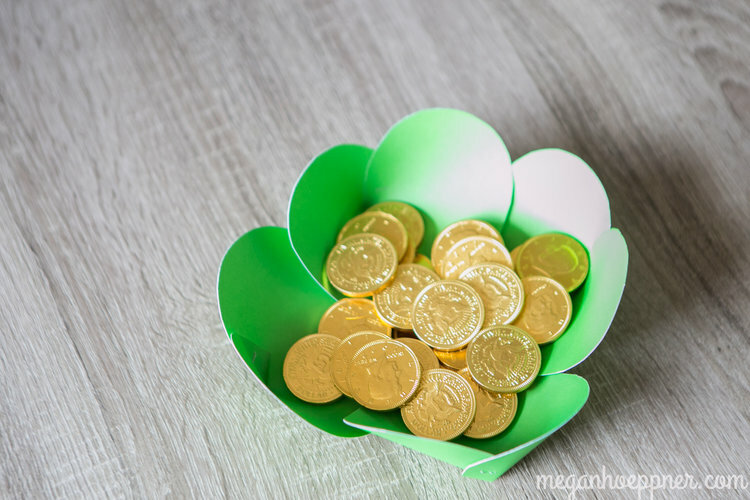 Once all four petals were in place, my clover dish was ready for its pot o’ gold! 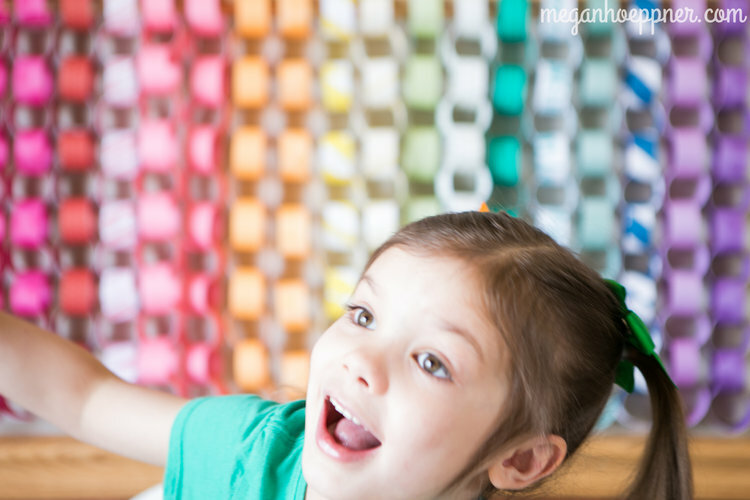 All in all, it was a fun crafternoon, making rainbows in our home. 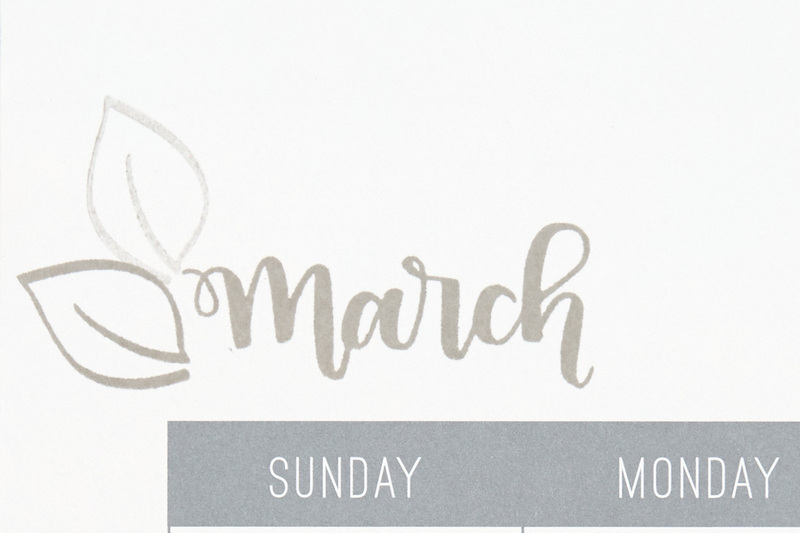 I look forward to pulling these pieces out year after year to make March a little more fun for my girls. So what exactly is a vision board? It’s a place to display images, words, or objects that represent both what you want to be and what you want to do with your life in one beautiful, central location. Our hope is that this fun project will help you solidify a vision for your art and your life for the upcoming year, all while keeping your thoughts and actions organized so you can accomplish this vision. Your vision board can become your light at the end of the tunnel during creative blocks. It can keep you motivated to continue on when things get hard. Now let’s dive into what you’ll need to do to create your vision board! As with all art projects on this blog, we encourage you to use the artwork you see here as a jumping-off point for your own artwork. 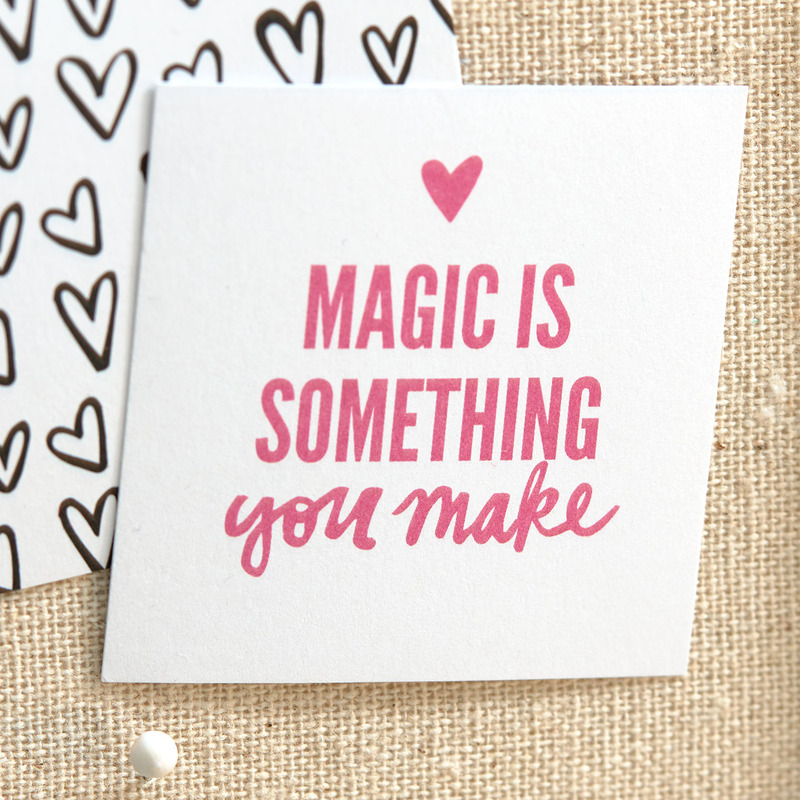 With a vision board in particular, it is especially important for you to make it your own! 1. Determine what you want your vision board to accomplish. Then find words, lyrics, or quotes that go along with your vision. 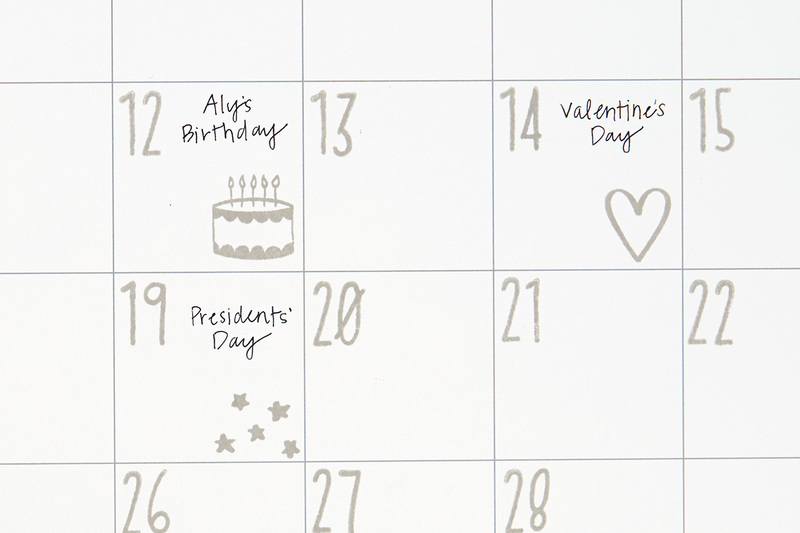 Use stamps, Cricut® cuts, Picture My Life™ cards, or simply your own handwriting to add these words of inspiration to your board. 2. Spell out your dreams and goals. 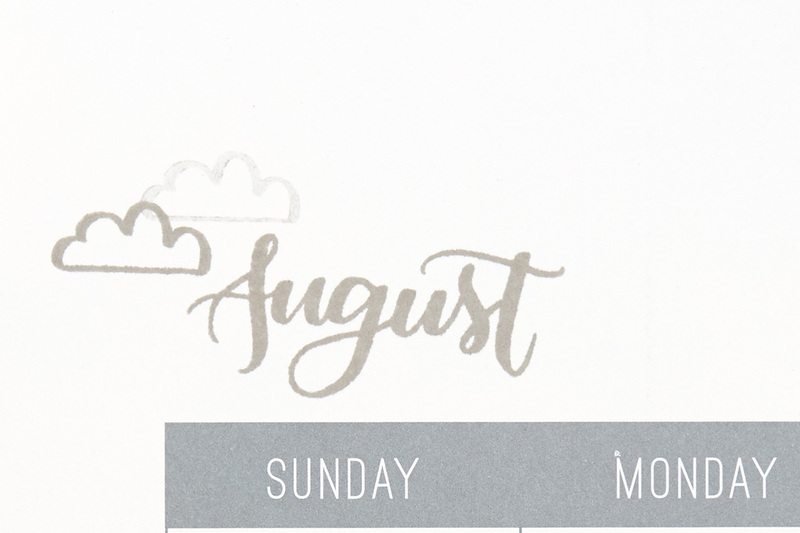 Whether it’s a list of crafting techniques you want to learn, projects you want to finish, places you want to visit, or dreams you have for your family or career, writing down your goals and reading them every day will help you take the steps necessary to bring your vision to life! 3. Always look for inspiration. A vision board is a project you never finish. It is a source of inspiration and a tool for staying organized, so it makes sense that it will change again and again over time. Every day, make an effort to notice the beauty around you, and then add anything that inspires you to your board. One simple way to do this is keep your eyes open while you craft. 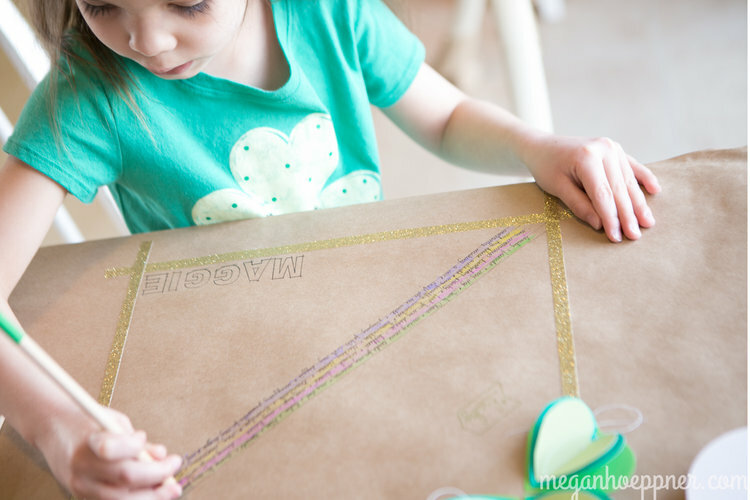 Add any embellishments, ribbon, washi tape, or Complements that speak to you. 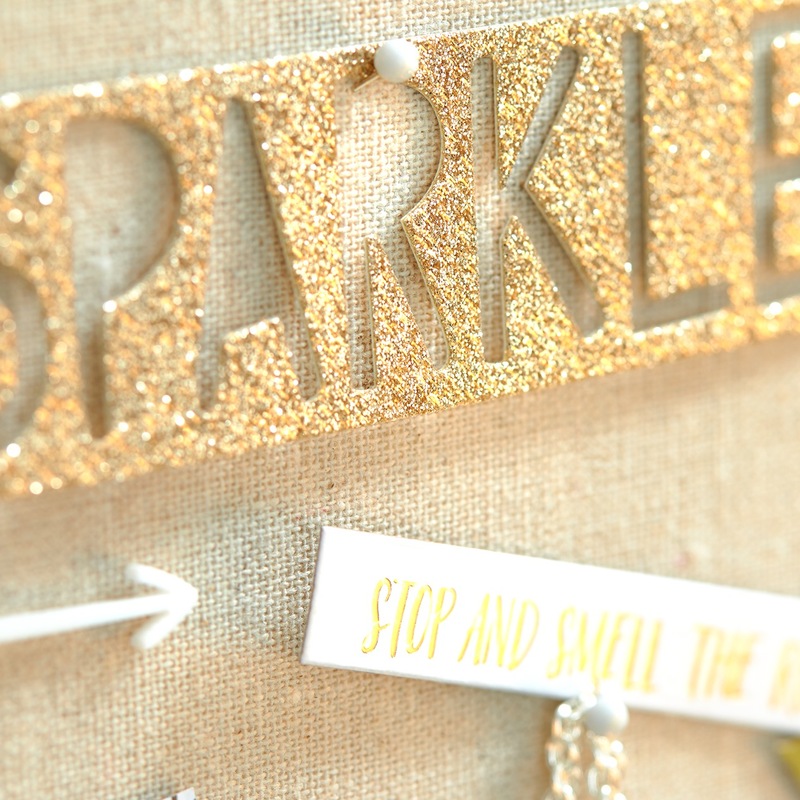 If you cut a little more shimmer trim than you need, add it to your vision board instead of tossing it out! 4. Use it as an organizational tool. Add to-do lists to your vision board. 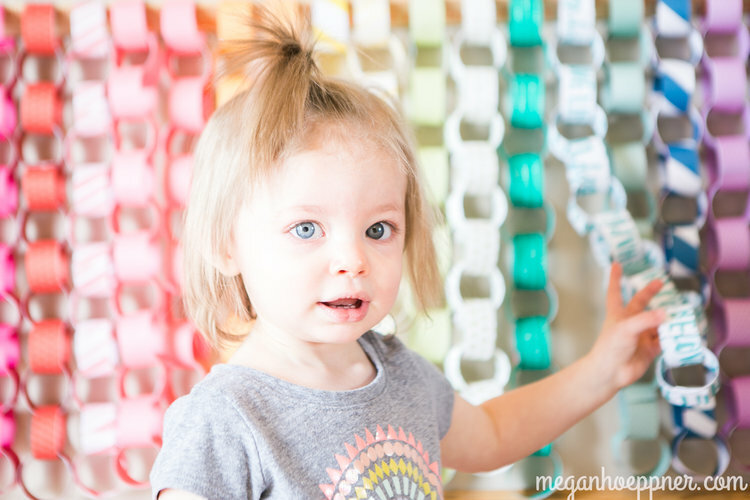 Tasks that might otherwise seem mundane become easier to tackle when they are part of the grand vision for your life—and plus, they look so much cuter! 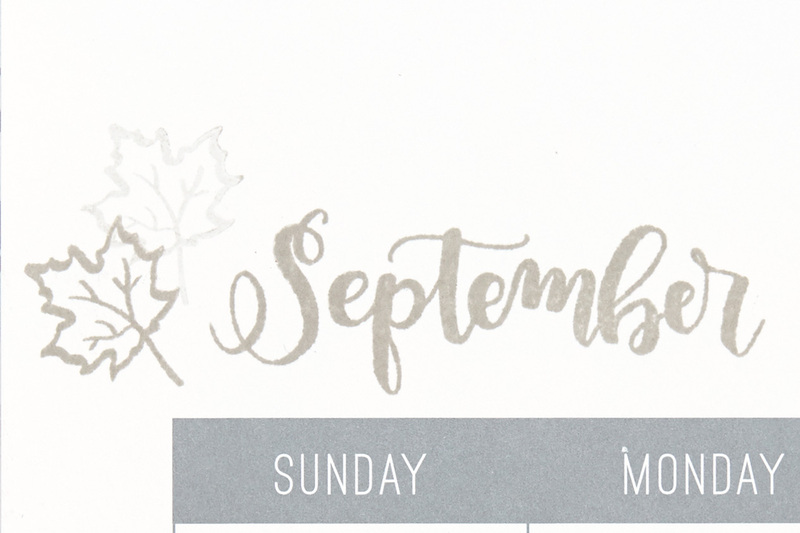 Even weekly schedules take on a new light when you dress them up. 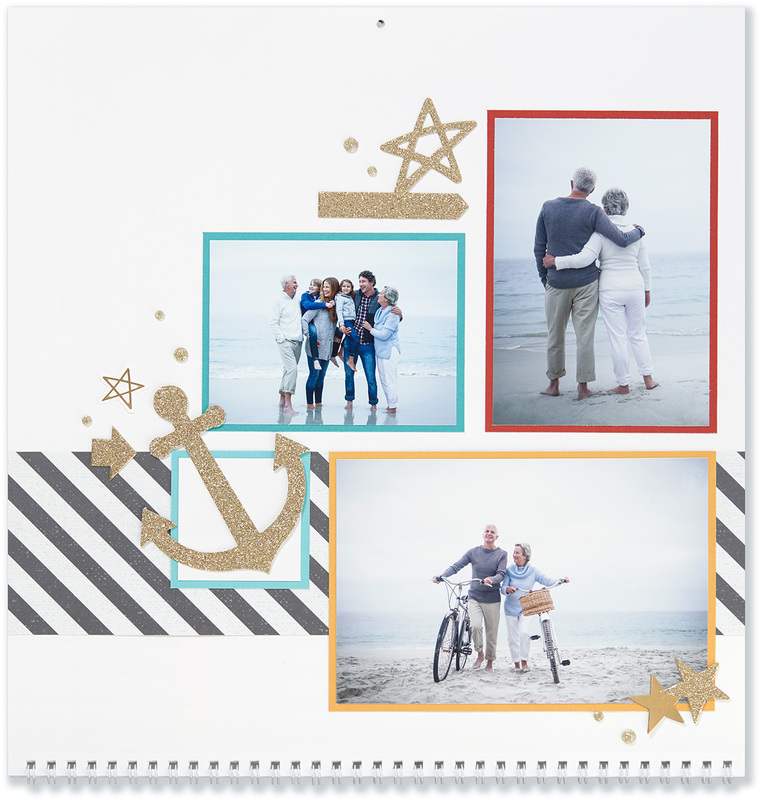 Your vision board is also a great place to include tasks you may otherwise procrastinate, such as sending a thank you card to someone or visiting an old friend. 5. Throw out the rulebook! Add items to your vision board that you’re naturally drawn to, not what you think you should be drawn to. Remember, your vision board should be a reflection of you! Get creative, choose things out of the ordinary, and be true to yourself. Dare to do things like stamp on a photo or add random scraps of doodling. The most important thing is not to overthink it—just follow your intuition! 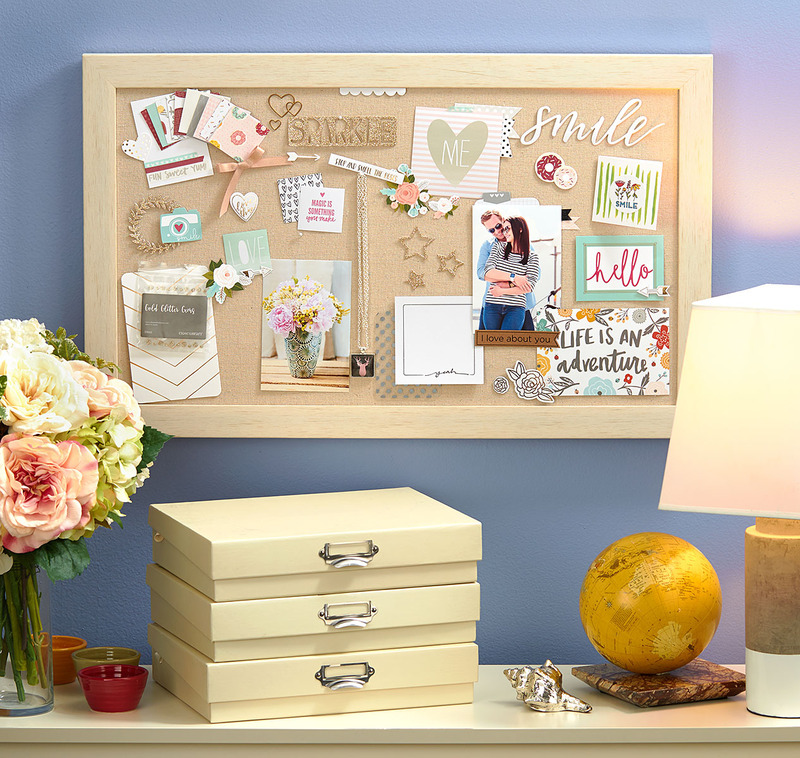 We’d love to see how your vision boards turn out! Share photos of your vision board on the Close To My Heart Facebook page! Bring the woods into your home this holiday season by creating your own whimsical paper pinecones. It’s a project that looks difficult, but is secretly super simple. In this post, we’ll show you how to make your own paper pinecones with a festive Christmas twist. 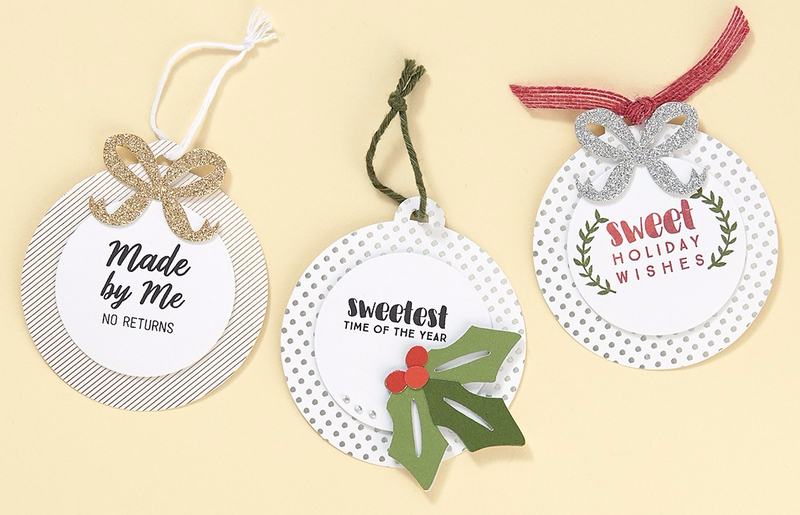 Once you’re done, these lovely paper creations can be displayed in a basket on your dining room table or hung as ornaments from your Christmas tree. For a more unique usage, try draping them from your doorknobs or adding them to Christmas gifts for a personalized touch that is sure to impress and delight! So put your Christmas music on, pull out your paper, and let’s get started. 1. 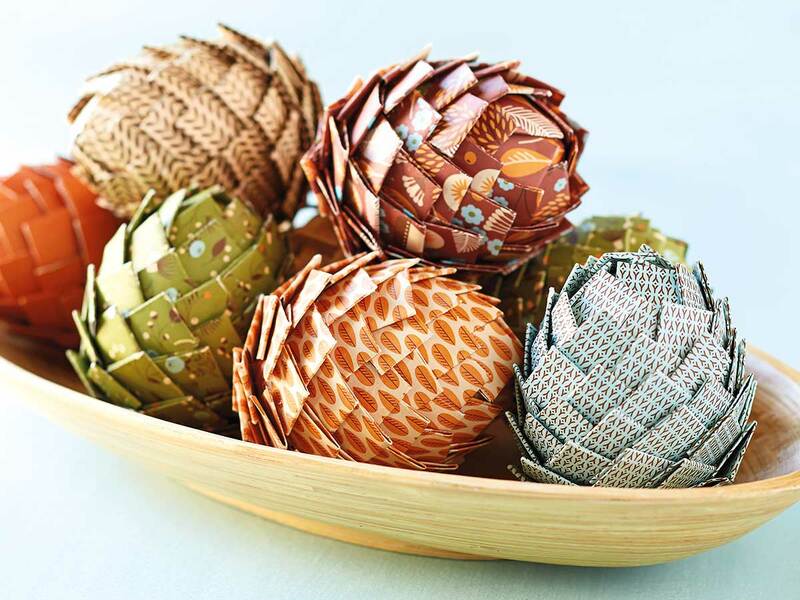 Choose a pattern of B&T paper to use for your pinecone. 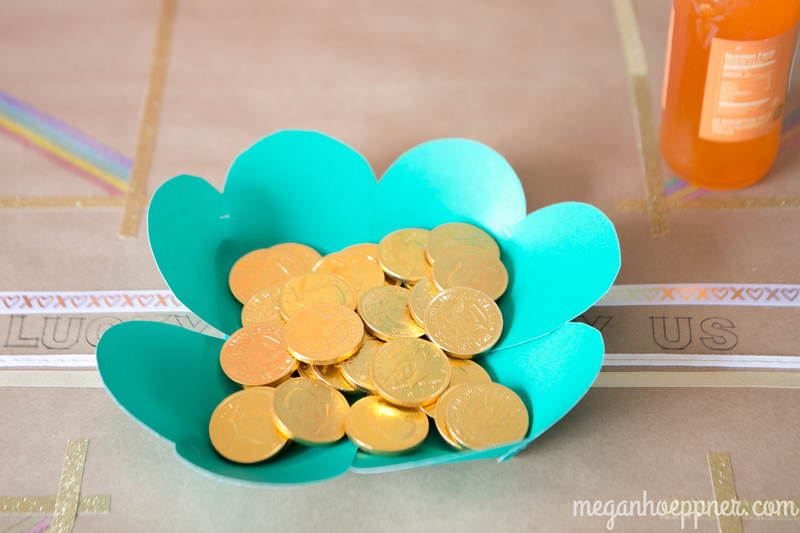 It’s important to use B&T because it will be much easier to fold than regular cardstock. 2. Next, cut two 1 ¼” circles from the corner of one of the sheets of B&T. 3. Using the scoreboard, score all remaining paper (including the paper you cut the circles from) every ¾” both vertically and horizontally to create a pattern of scored ¾” squares across both B&T papers. 4. Now cut all the scored B&T into 1 ½” x 1 ½” squares. This means you will have four ¾” scored squares on each cut 1 ½” x 1 ½” paper square. 5. Fold all the 1 ½” x 1 ½” squares in half and then in half again in order to form a ¾” folded paper square. 6. On the top point of the egg, adhere one of the paper circles using liquid glass and straight pins. Keep the pins close to the outside of the circle so they can be easily concealed. 7. Layer the first five folded paper squares around the paper circle, adhering with pins and drops of liquid glass. Point squares toward the center of the top of the egg and insert pins at the bottom point of the square. 8. Continue layering folded paper squares, working in a circular pattern around the egg. Make sure you cover the raw edges of the preceding layer with each succeeding layer. 9. Once you have reached the bottom of the egg, finish it off by adhering the remaining 1 ¼” circle of paper with liquid glass to cover the raw edges and pins at the bottom. 10. 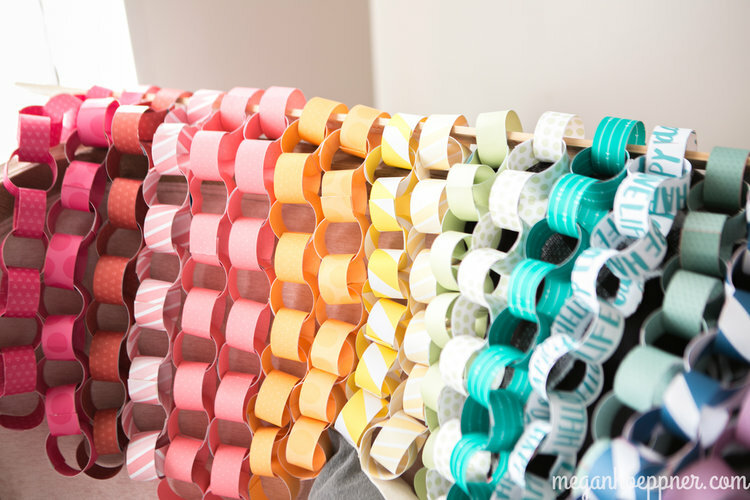 Revel in the beauty of your paper creation. Nice work! You might just give Mother Nature a run for her money.